Conservation Units (Unidades de Conservação – UCs) cover 22% of the Legal Amazon and are an effective strategy to preserve animals, plants and environmental services, and also to halt deforestation and to maintain the planet’s climate balance. 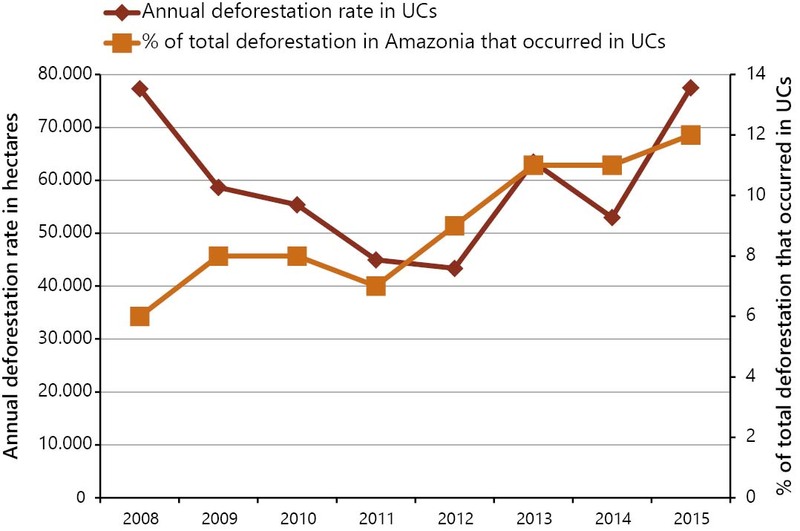 However, deforestation rates in UCs have been increasing – in 2015, they already surpassed the 2012 rate by 79% – and its participation in Amazon’s total deforestation increased from 6% in 2008 to 12% in 2015. As a consequence of the deforestation of 237.3 thousand hectares in UCs between 2012 and 2015, equivalent to R$ 344 million in appropriated lands, approximately 136 million trees were destroyed, causing death or displacement of approximately 4.2 million birds and 137,000 monkeys. 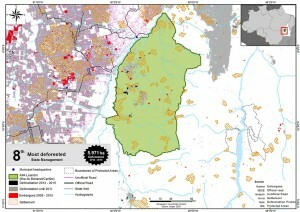 In addition, we estimated that the burning of vegetation in this deforested area has emitted 119 million tons of carbon dioxide equivalent per year – which compares to 80% of Brazil’s car fleet emissions in September 2016; and that this deforestation generated gross income of R$ 300 million from the sale of timber (value of standing timber), creating a huge investment potential in deforestation. 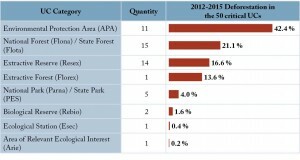 In this context, we identified the 50 most deforested UCs between 2012 and 2015 in the Legal Amazon, which represent only 16% of the total UCs in the region. 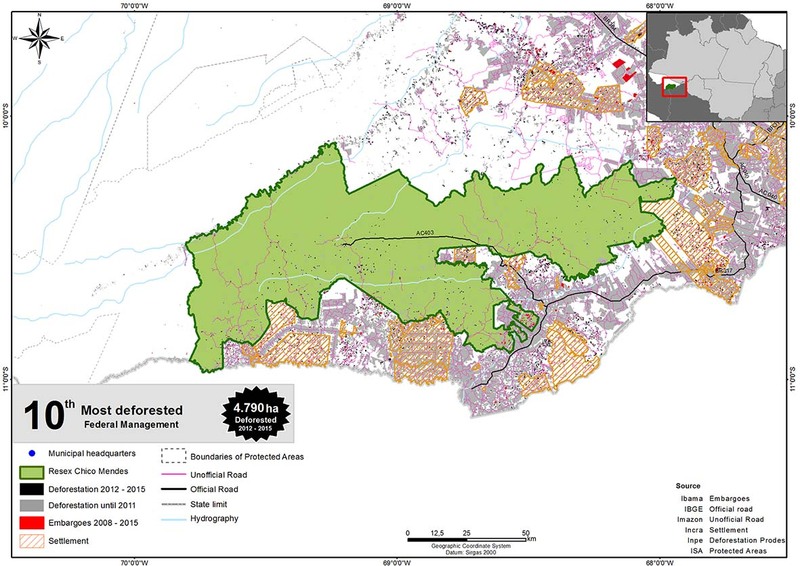 Overall, they lost 229,900 hectares of forest, that is, 97% of the area deforested in UCs between 2012 and 2015. 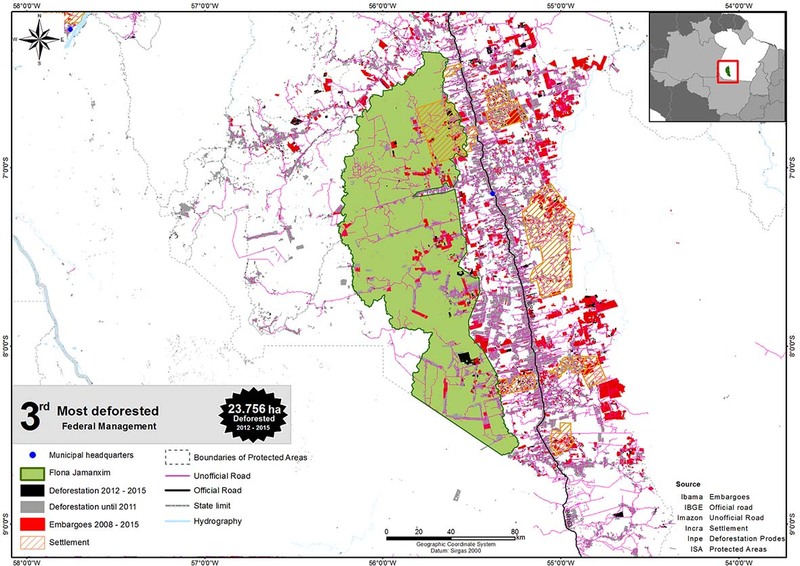 These UCs in critical deforestation situations are in the area of agricultural frontier expansion and under the influence of infrastructure projects, such as highways, waterways, ports and hydroelectric power plants. Most of the deforestation detected in the period, 49.8% and 38.9% is concentrated in the states of Pará and Rondônia, respectively. The federal UCs are in a larger number on the ranking (27), but the state ones presented a greater deforested area (68%). The top 10 ranking positions accounted for 79% of the deforested area within the Legal Amazon UCs between 2012 and 2015 and 82% of the deforestation total on the ranking. The Environmental Protection Areas (APA) occupy five of the top 10 positions. They aim to reconcile human occupation with environmental protection, but this is not possible without management tools. 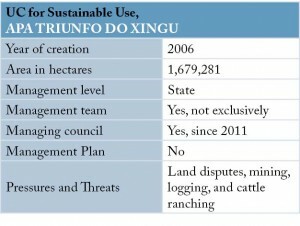 Among state UCs, we highlight APA Triunfo do Xingu, which is the most deforested UC of the Legal Amazon. 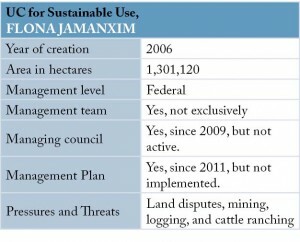 Among federal UCs, Flona Jamanxim is the most deforested and holds 3rd place on the ranking. The vulnerability of these areas stems from systemic failures of the government, which has a duty to protect them. 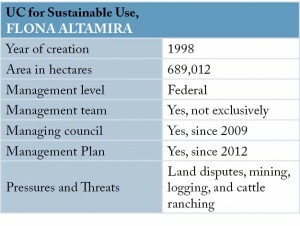 Among these vulnerabilities, we highlight: i) the erratic and limited strategy of the government, which consists of changing rules and weakening environmental legislation according to current interests and tolerating illegal deforestation until 2030; ii) the scarce human resources for management and the worrying trend of a reduction in the number of federal environmental analysts stationed in the Amazon, 40% in ICMBio (2010-2016) and 33% in Ibama (2009-2015); iii) insufficient financial resources to make the necessary investments to implement the UCs – only 16 critical federal UCs in this study would need R$ 10.6 million per year, which is 3.26 times higher than the average of ICMBio investment resources between 2014 and 2016 for the whole country and 3.42 times higher than that projected for 2017; iv) the ineffectiveness in execution, which is revealed in the low application of available financial resources. 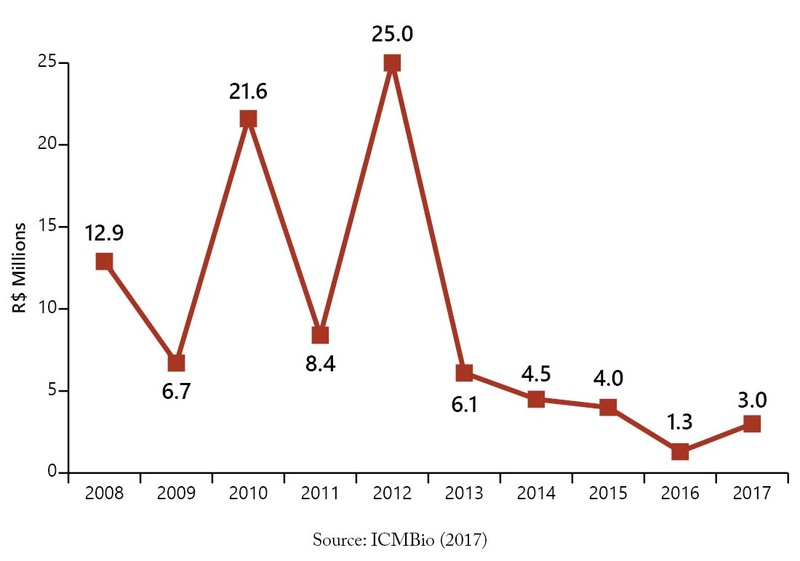 For example, between 2009 and 2014, ICMBio used only 35% of the R$ 218 million received for environmental compensation; the slowness in combating irregular occupations, which causes environmental and social damages; and the low rate of punishment for environmental and agrarian crimes. Ensure immediate protection of the most critical areas and their populations. It is necessary to protect the local populations of the Amazon, such as indigenous peoples and rubber tappers, who have fought and continue to fight for the creation and maintenance of protected areas. Several agents, besides the police, could contribute to this. Social and environmental NGOs, governments, and international and national donors could increase support for these populations and the implementation of the areas based on the experiences of PPG7 (G7 Rainforest Protection Program) and Arpa (Amazon Protected Areas Program), which permitted the creation of tens of millions of hectares of protected areas in the Amazon. In addition, they could also support the long-term implementation of UCs, as Arpa intends to do. Religious leaders and their followers could step up support for conservation based on Pope Francis’ Encyclical Letter, which calls for forest conservation as part of the effort to care for the common home (the planet). Military forces could intensify their action in the fight against deforestation and the land grabbing of public lands in areas of greater conflict. In addition, the Public Prosecution Service and the Courts of Accounts could hold public administrators accountable for reducing the area or degree of protection of UCs to meet the demands of squatters illegally occupying public property, based on the Law of Responsibility of the President of the Republic and of the Ministers of State and in the Administrative Improbity Law. Block the demand and financing of illegal deforestation. There is a need to increase the pressure on businesses to improve and expand their commitment to sustainability. To this end, Public Prosecutor’s Service and environmental agencies could increase the liability of companies that buy products from illegally deforested areas and those that finance such activities. They could also monitor the implementation of Resolution No. 4.327/2014, which requires financial institutions to establish and implement the Social and Environmental Responsibility Policy (PRSA). NGO campaigns and investigative reporting on law-breaking companies could strengthen such accountability actions and protect companies that comply with laws and agreements from unfair competition. In addition to boycotting illegal production, it is essential to stimulate sustainable production in areas already deforested outside UCs. However, public credit directed exclusively to the most sustainable practices in Brazil (ABC Program – low carbon agriculture) will represent only 1.6% of the country’s total rural credit in the 2016-2017 Agriculture and Livestock Plan. But the financial sector could help scale up sustainable production initiatives by engaging more strongly with governments, producers, and supply chain partners (such as traders, slaughterhouses, supermarket chains) to identify opportunities and remove barriers. Ensure the long-term sustainability of Conservation Units. Several approaches could sustain conservation in the long term. Involvement will tend to be stronger when involving sensorial and emotional experiences, such as tourism, educational expeditions, artistic and sporting events. Such activities could strengthen the regional economy and create a virtuous cycle – UCs would increase tourism which, in turn, would increase the desire to conserve. It is estimated that tourism in UCs already moves approximately R$ 4 billion per year, generates 43 thousand jobs and adds R$ 1.5 billion to the Gross Domestic Product (GDP). Such an approach could bring together environmental, cultural and commercial interests, similar to the US experience with the creation of national parks. In addition to local benefits, scientific research shows that conserving the Amazon is strategic for the country’s development because of its contributions to rainfall that fuels agriculture, hydroelectric power plants and industrial consumption in the southern center of the country. In order to engage national leaders who are unaware of the Amazon, scientists, educators and other professionals could develop programs that combine the presentation of scientific evidence about the Amazon with sensory and emotional experiences through field visits and other means (shows, films, etc.). In 2015, there were 315 Conservation Units (UCs) in the Legal Amazon, covering 112.6 million hectares or 22% of the region (ISA, 2015a). These areas, together with the Indigenous Lands and the rest of the region’s public and private forests, contribute to the formation of rain in the Mid-South of the country, which are essential for energy generation, agricultural production and the industrial and domestic consumption of large cities (Nobre, 2014). These UCs, associated with recognized Indigenous Lands (Terras Indígenas – TIs), were responsible for the 37% reduction in deforestation between 2004 and 2006 (Soares-Filho, B. et al, 2010) in the Legal Amazon. The UCs also contributed to reduce deforestation by 84% in 2012 compared to 2004, the year in which the Action Plan for Prevention and Control of the Legal Amazon Deforestation (PPCDAM) started. Deforestation avoided during this period reduced 56% of greenhouse gas (GHG) emissions (SEEG/OC, 2016). In addition, it is estimated that between 2001 and 2012, up to 1,700 lives were saved per year in South America, thanks to the reduction of pollutants in the atmosphere by the reduction of deforestation and associated fires in the Brazilian Amazon (Reddington et al, 2015). In spite of the importance of UCs to Brazil, in 2013, an audit by the Federal Court of Accounts (TCU) and the State Courts of Accounts (TCEs) of Legal Amazon revealed that 96% of UCs in the region had low or medium implementation level. This means that UCs did not have necessary instruments and sufficient resources for their management and were not used for the intended purposes, such as research and tourism (TCU, 2013). The Courts of Accounts then recommended that state and federal governments submit action plans to implement UCs. However, a recent analysis of these plans indicated that they are weak and insufficient to resolve the problem (Araújo et al, 2016). The low implementation, especially with regard to territorial issues, leaves UCs vulnerable to threats. Illegal occupiers exploit wood and land in a predatory manner and fight for the revocation or reduction of the size or degree of protection of some UCs through lawsuits or political pressure (Araújo & Barreto, 2010; Martins et al, 2014). Between 1995 and 2013, the Executive and Legislative branches reduced 2.9 million hectares of UCs in the Amazon (Martins et al, 2014). 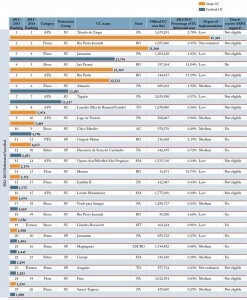 Irregular occupations and plans for the construction of hydroelectric power plants have been the most frequent motives for the alteration of UCs in the Amazon and Brazil (Pack et al, 2016; Martins et al, 2014; Bernard et al, 2014). 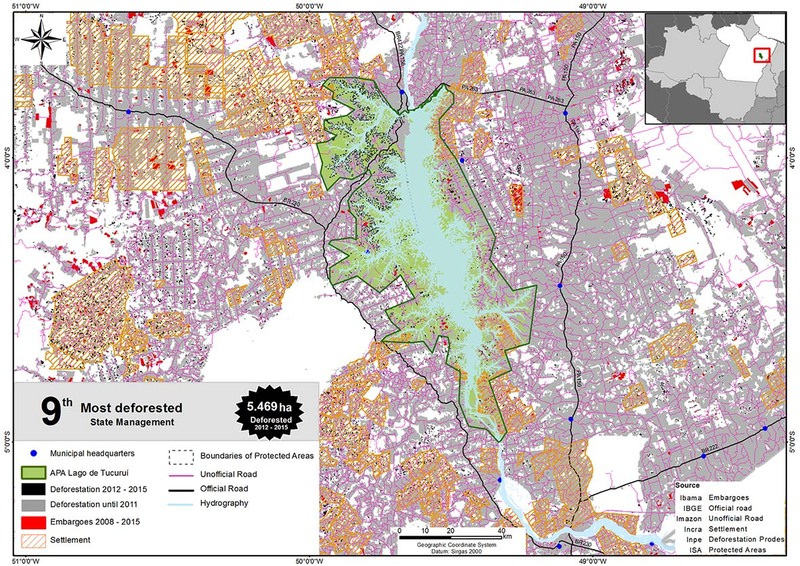 In view of this situation, we carried out this study to demonstrate the critical deforestation situation of some UCs in the Amazon and, thus, contribute with relevant information that may help Brazil to protect such heritage from deterioration. Initially, we presented the trend of deforestation in the UCs since 2008 and updated the ranking of the 50 most deforested UCs in the Legal Amazon between 2012 and 2015. Next, we identified the immediate causes of deforestation and the pressures and risks of reduction, recategorization (for less protection) or revocation for the top 10 positions in the ranking, which, together, account for 79% of the total deforested area within UCs for the period. Finally, we identified the agents and the measures that can guarantee the effective protection of the UCs and their sustainability in the long term, considering the best practices and national and international lessons. For the calculation of the area covered by UCs in the Legal Amazon, we subtracted the overlaps between state and federal UCs and between these and Indigenous Lands. The PPCDAm aims to continuously and consistently reduce deforestation and create the conditions to establish a model of sustainable development in the Legal Amazon. The actions of the plan are articulated around three themes: i) land and territorial use; ii) environmental monitoring and control; and iii) promotion of sustainable productive activities (MMA, 2013). The percentage share of UC deforestation in the Legal Amazon deforested total has doubled from 6% to 12% between 2008 and 2015 (Figure 1). This trend indicates a more severe decline in efforts against deforestation in areas that should receive more attention. 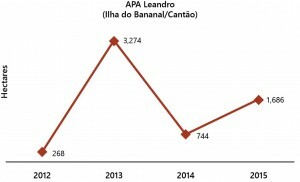 According to the Project for Monitoring Deforestation in the Legal Amazon by Satellite (Prodes), deforestation in UCs in 2015 was 79% higher than in 2012, the year in which Brazil reached the lowest rate of deforestation in its history (Figure 1). Between 2012 and 2015, 237.3 thousand hectares were deforested in UCs in the Amazon (Inpe, 2016), destroying approximately 136 million trees and causing the death or displacement of approximately 4.2 million birds and 137 thousand monkeys. We estimate that during this period the burning of vegetation in this deforested area resulted in the emission of 119 million tons of carbon dioxide equivalent per year. This figure is comparable to the annual emissions of carbon dioxide by 41 million cars or 80% of the Brazilian car fleet. 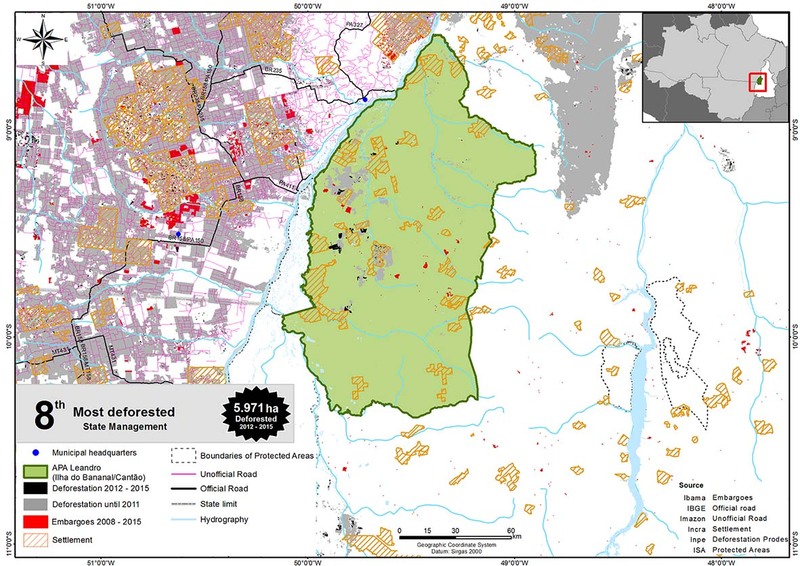 The occupants of the deforested areas between 2012 and 2015 may have obtained a gross income of R$ 300 million from the sale of timber, considering the value of standing timber, which has created an enormous potential for investment in deforestation. In addition, they took possession of land assets in the amount of R$ 344 million, taking into account only the market value of deforested areas in that period. Such estimation is based on the mean density of trees and animals compiled by Vieira et al (2005). Our estimation considered the average emission of greenhouse gases in the burning of one hectare of forest and the average emission of light vehicles and the size of the Brazilian fleet. The car fleet in Brazil in September 2016 was 50,902,511 according to the National Traffic Department (Source: http://www.denatran.gov.br/index.php/estatistica/261-frota-2016). For this estimate we considered the potential to explore on average 25 cubic meters of wood per hectare and the average price of standing timber (tree in the forest) of R$ 41.47, found by Santana et al (2012), and the monetary adjustment by the IGP-M (FGV) for the period from December 2012 to December 2015. We obtained the market value of land in Agrianual (2015). 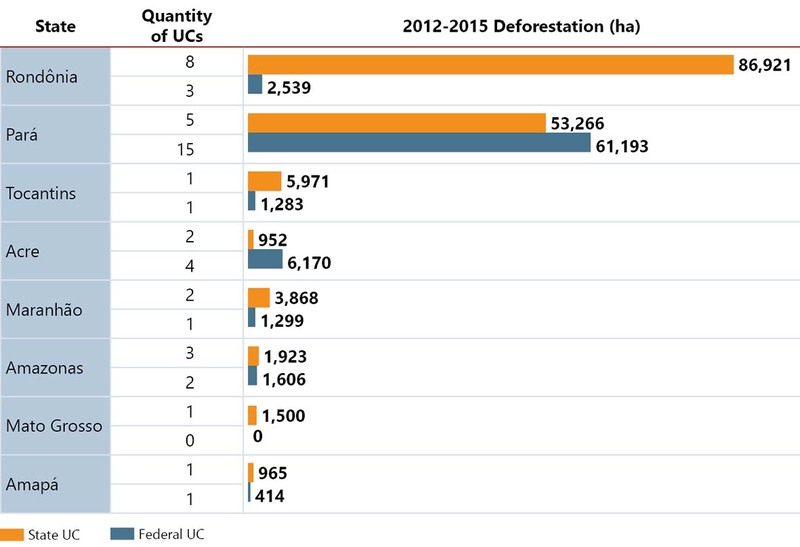 To help focus efforts to control and combat deforestation in Legal Amazon UCs, we identified the 50 most deforested UCs between 2012 and 2015, which represent only 16% of the total UCs in the region. Together, they lost 229,900 hectares of forest, equivalent to 97% of the deforested area in the Amazon UCs during this period (Figure 2). 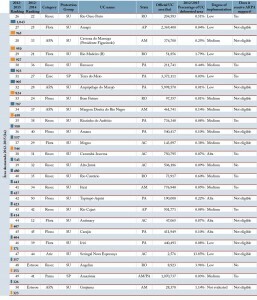 These 50 UCs in critical deforestation situations are in the area of expansion of the agricultural frontier and under the influence of infrastructure projects, such as highways, waterways, ports and hydroelectric power plants. See ranking in figure 3. The 50 critical UCs are in eight of the nine states of the Legal Amazon, with most of the deforestation detected presented in the states of Pará and Rondônia: respectively 49.8% and 38.9% (Figure 4). 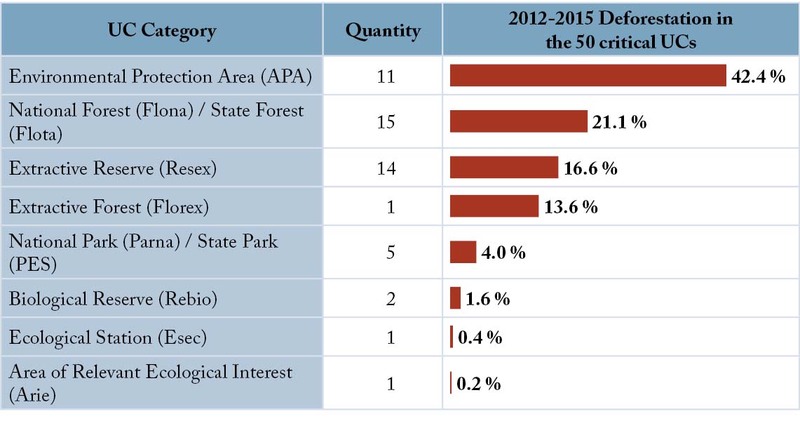 The UCs under federal management are in a larger number on the ranking (27), but the state ones showed the biggest deforested area (68%), as shown in Figure 5. Ninety-four percent of deforestation was concentrated in 42 sustainable use (SU) UCs – which allow extractive activities, such as logging and even the presence of rural properties. In this group, the categories that were deforested the most were: APA, with 42.4%; National / State Forest (Flona / Flota), with 21.1%; and the Extractive Reserve (Resex), with 16.6% (Figure 6). In the strict protection (SP) group – which only allows activities with the indirect use of natural resources, such as research and tourism – there were eight, representing only 6% of the deforested total. Among critical UCs, only APAs and Areas of Relevant Ecological Interest (Arie) allow non-traditional occupants on private properties, such as cattle farms. While Flonas, Flotas, Florex and Resex allow only traditional populations inside their boundaries, as the lands are of the public domain. Parnas and State Parks (PES), Biological Reserves (Rebio) and Ecological Stations (Esec) do not allow any human occupation. However, several UCs of different categories face irregular occupations, either because they were created in areas that were previously occupied or because they were invaded. Most of the critical UCs have a low (42%) or medium (44%) degree of implementation according to the evaluation made by the Federal Court of Accounts (TCU, 2013) and only four have a high degree of implementation. 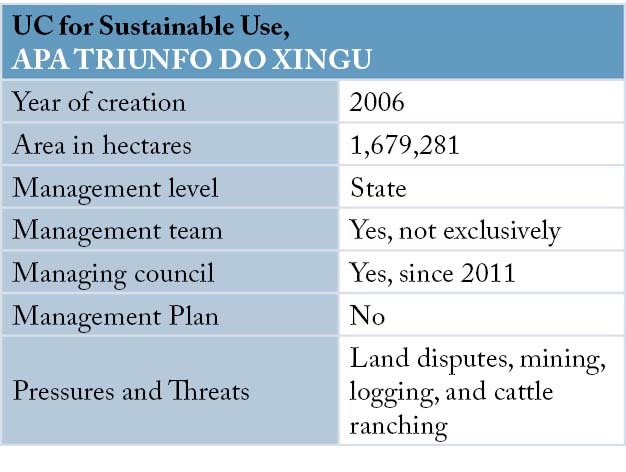 Out of the 50 most deforested UCs, 28% do not have a managing council, and 56% do not have a management plan. By traditional populations we make reference to traditional peoples and communities that are culturally differentiated and recognize themselves as such, who have their own forms of social organization, occupy and use territories and natural resources as a condition for their cultural, social, religious, ancestral and economic reproduction; and use knowledge, innovations and practices generated and transmitted by tradition. That is the definition of Article 3 of Decree No. 6.040/2007, which established the National Policy for Sustainable Development of Traditional Peoples and Communities. The Federal Public Prosecution Service defends the permanence of traditional populations in the UC categories of strict protection, and proposes the shared management of territories and resources that are common to the interests of these populations and to environmental conservation (MPF/6thCCR, 2014). 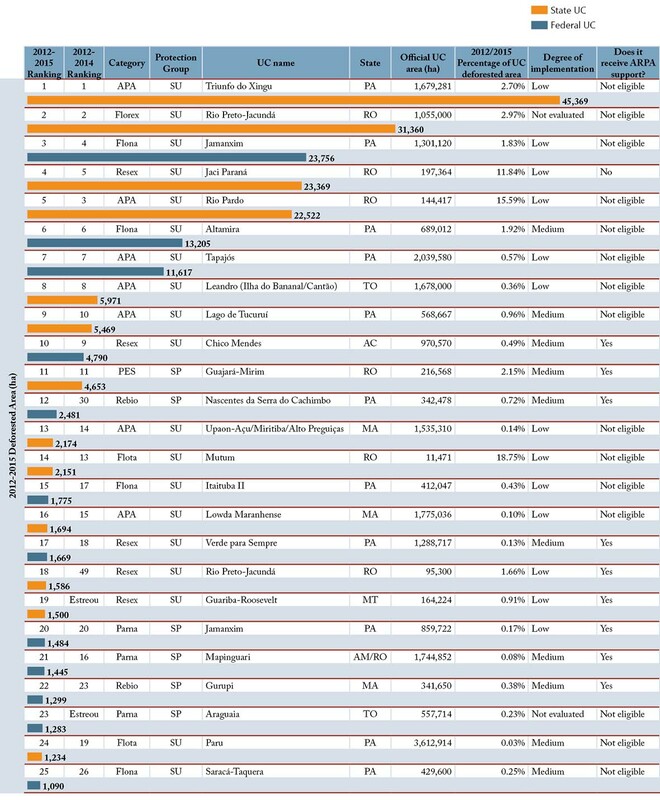 The first 10 positions in the ranking concentrated 79% of the deforested total within Legal Amazon Conservation Units between 2012 and 2015 and 82% of the total deforestation in the ranking of the 50 UCs (Figure 7). Eight of them showed a trend of increase in the annual rate of deforestation and two presented a trend of reduction, as shown in the graphs in the subsections dedicated to each UC. It is interesting to note that these UCs remained in the top ten positions in relation to the previous ranking (2012-2014), with five rising, two falling, and three maintaining their positions. 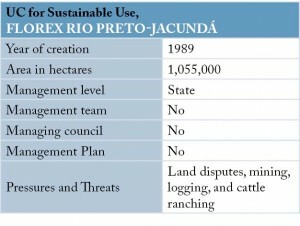 All 10 UCs are for sustainable use and are distributed in three protection categories, considering that Florex and Resex have the same purpose: five APAs, which aim to discipline the process of non-traditional occupation and ensure the sustainability of the use of natural resources; three Florex / Resex, which aim to protect the territory used by traditional extractive populations, who manage the timber and non-timber forest resources; and two Flonas, aimed at the sustainable management of native forests. Low governance to achieve the objectives of creating these UCs explains their high rates of deforestation. 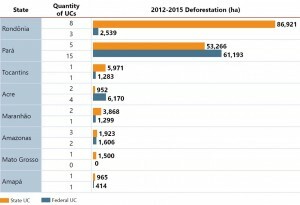 Next, we present maps and graphs of deforestation between 2012 and 2015 for each of the 10 most critical UCs, in descending order on the ranking, and we analyze the causes of deforestation, the pressures and the risks to which they are subject to in order to reduce their protection in size or degree. 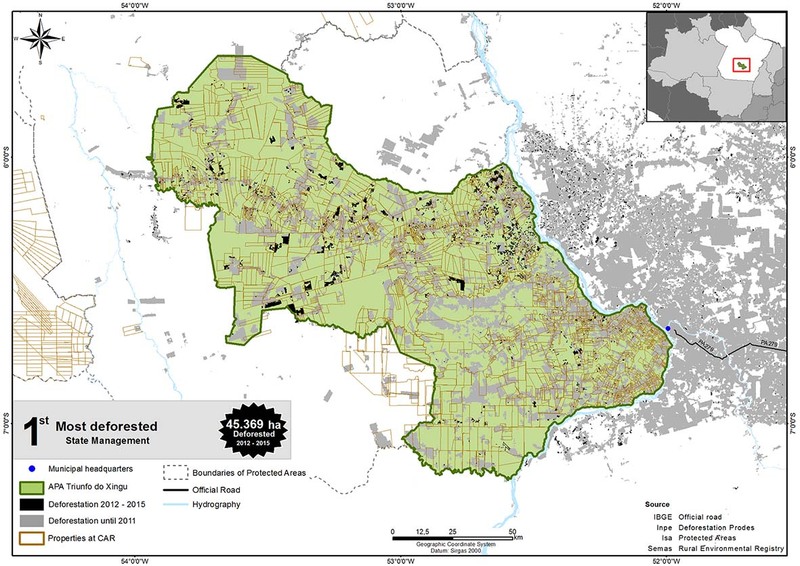 We also present maps of the Rural Environmental Registry (CAR) for the UCs of the state of Pará, according to data available in February 2016. 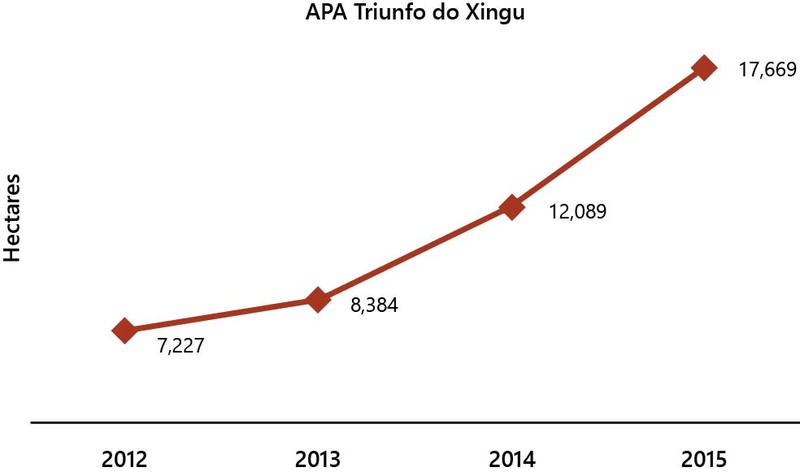 APA Triunfo do Xingu is the most deforested UC of the Amazon, concentrating 20% of the deforested total in the 50 critical UCs (Figure 8). Since 2012, its deforestation rate has been increasing (Figure 9). 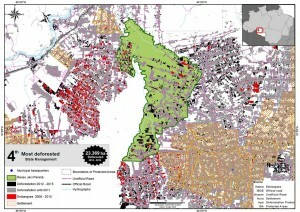 Irregular occupation of land is the main cause of deforestation in the UC, since it is used to characterize possession. Irregular occupation has already spread throughout the entire extension of the UC (Figure 10), since there is no management plan that indicates the areas that should be destined for the conservation of environmental resources and services, and as a result, that cannot be occupied. There is not even a land survey to guide the land regularization of the UC and its occupations. 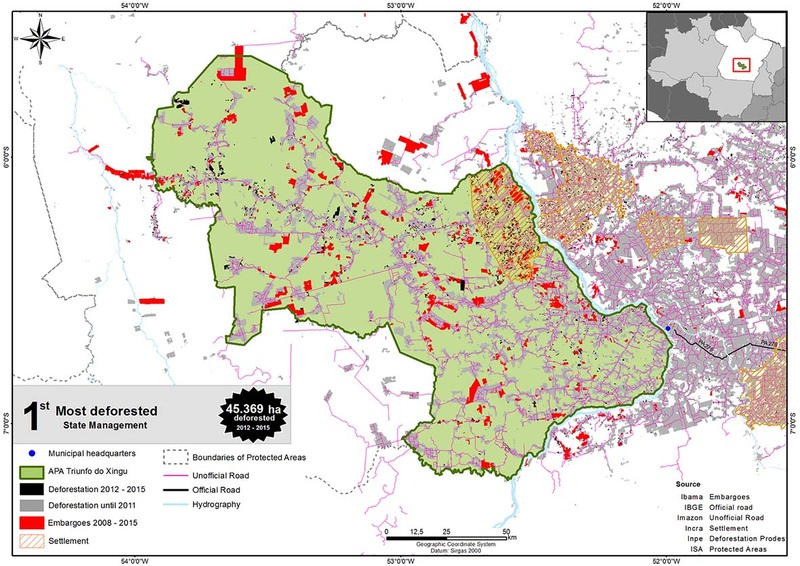 On the other hand, the fact that more than 80% of its territory is registered in CAR (Figure 10) should inhibit illegal deforestation, since CAR allows the identification of who claims to be the owner of the area and the remote monitoring of forest coverage. However, it is important to note that there are many fraudulent records in CAR, carried out with the Individual Taxpayers’ ID (CPF) of people who are not in the area, which makes it difficult to allocate accountability for illegal deforestation. The state land agency in Pará (Iterpa) refuses to regularize the occupations of the UC because it claims that it cannot intervene without a management plan or other management instrument that regulates its use and occupation. In addition, in 2015 at a meeting of the UC managing council, it became clear that the occupants of large tracts of land were not interested in regularization, as they were not willing to pay for the public land they occupied (Ideflor-bio, 2015a). This is the case of the representative of the Union of Rural Producers of São Félix do Xingu, who stated that he did not intend to pay for the 125,000 hectares he occupied in the area. The UC has a management team of four people, which also manages three other UCs, totaling 2.1 million hectares. According to the team, the monitoring of the UC is precarious, carried out only once a year or when there is a complaint, and the occupiers believe in impunity and intend to deforest 100% of their land. These occupants include family farmers and small, medium and large-scale farmers, whose predominant activity is cattle ranching (Romier et al, 2016). 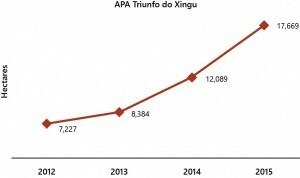 Information obtained in conversation with the management team of APA Triunfo do Xingu, on August 3, 2016. Information obtained in conversation with a representative of the legal department of Iterpa, on August 31, 2016. 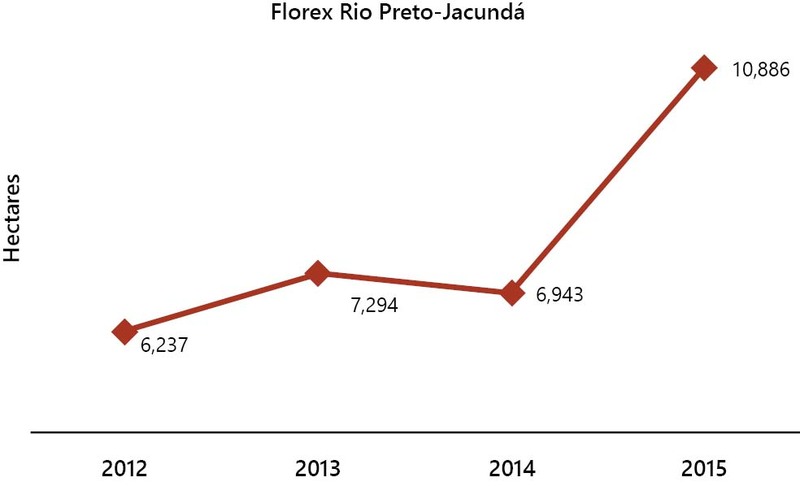 Florex Rio Preto-Jacundá presented an increasing trend of deforestation between 2012 and 2015 (Figures 11 and 12). In 2015, its deforested area was 57% higher than in the previous year, reaching approximately 11,000 hectares. 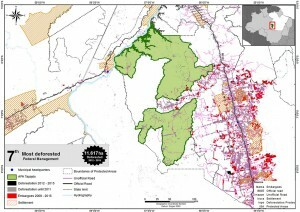 The main pressures and threats to the UC are associated with lland disputes and cattle ranching. Florex is very vulnerable to pressures and threats because it is not recognized by the environmental agency, and it is not being managed. This is because six years after its creation, the government of Rondônia, through a decree, created a Resex of the same name overlapping 95.3 thousand hectares (9% of its area) of Florex. The government claimed that Decree No. 7.336/1996 which created Resex revoked the Decree No. 4.245/1989 which had created the Florex. The Secretariat for Environmental Development (Sedam) of Rondônia keeps this understanding and emphasizes that the State System of Conservation Units (Seuc) does not recognize Florex as a UC category. However, the State Prosecution Service of Rondônia (MPE-RO) understands that Florex could only have been repealed by a specific law, approved by the Legislative Power for this purpose, according to a constitutional requirement (Article 225, paragraph 1, III). In this case, the decree that created the Resex is an act of the Executive Branch and does not mention Florex. Therefore, from a legal point of view, there was no implicit reduction, since such a change would be unconstitutional. 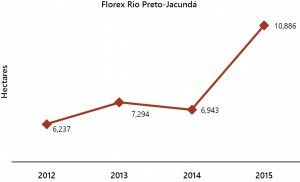 Approximately 35% of the Florex area is overlapped with three UCs: Flona Jacundá (19.55%), Esec Samuel (5.72%) and Resex Rio Preto-Jacundá (9.57%) (ISA, 2016). 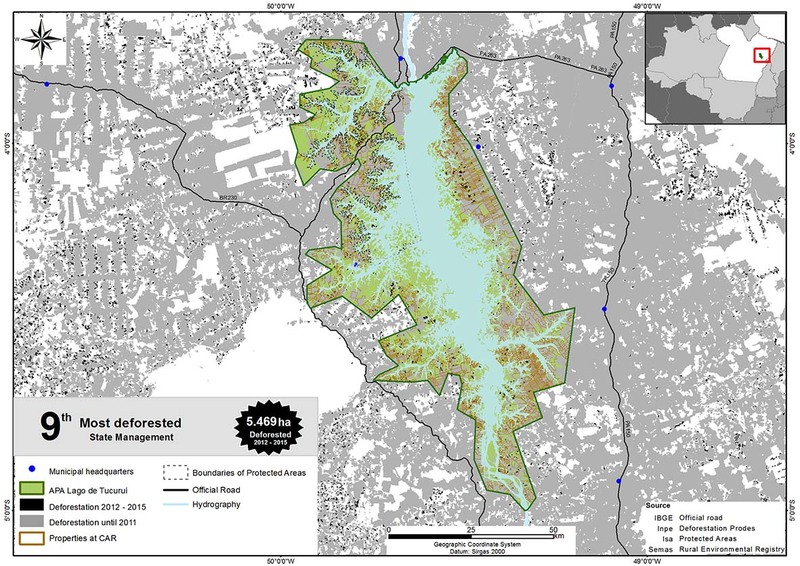 Discounting these overlaps, the “forgotten” area of Florex is 686 thousand hectares, and it is in this area that deforestation is increasing. There is still no legal action from MPE-RO demanding the actual management of Florex. Decree Law no. 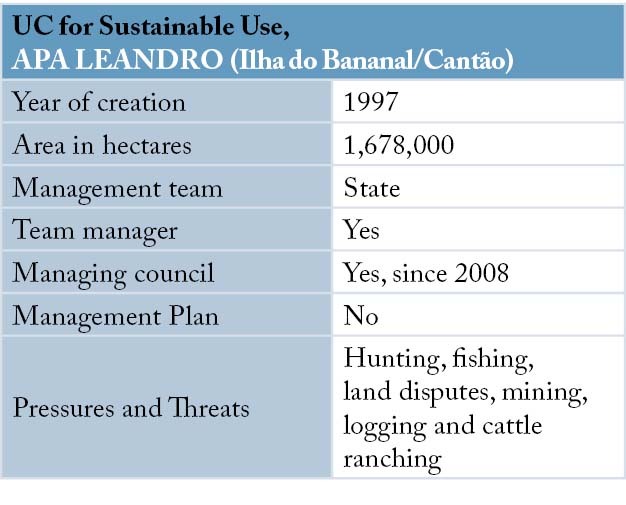 1.144/2002 created the State System of Nature Conservation Units of Rondônia (Seuc/RO). A response was sent by the Operational Support Center for Environmental issues of the State Prosecution Service of Rondônia, by email dated May 18, 2015. Figure 11. 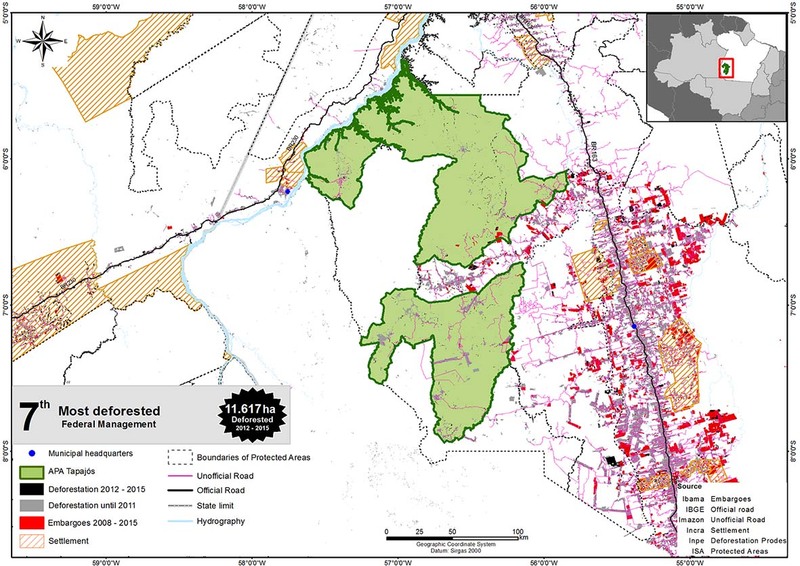 Map of deforestation in Rio Preto-Jacundá State Extractive Forest between 2012 and 2015. 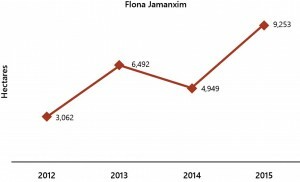 Flona Jamanxim is the most deforested federal UC of the Amazon (Figure 13); and showed an increasing trend of deforestation between 2012 and 2015 (Figure 14). In 2015, Flona lost more than 9.2 thousand hectares of forest, an area 87% higher than in 2014. The main pressures and threats to the UC are associated with land disputes and cattle ranching. Flona does not allow non-traditional occupation. However, a socioeconomic survey of 2009 shows that the existing occupations were characterized by high land concentration, low employability and low productivity (extensive beef cattle) (ICMBio, 2009). There were no landowners with land title within Flona, but only holders, speculators of public lands. In this context, increasing deforestation is used to de-characterize the UC, pressure for its reduction and show “productive occupation of the land” for future land regularization. Deforestation occurs within occupations registered in the CAR (Figure 15). The UC does not have an exclusive management team, according to its manager, who is also responsible for Flona Altamira and Rebio Nascentes da Serra do Cachimbo. Flona Jamanxim is in the area of activity of the ICMBio Regional Coordination in Itaituba (CR-3), which has 25 analysts and three technicians to manage 12 UCs, covering a total of 9.2 million hectares. The surveillance actions are carried out by only six people at CR-3, which in 2015 suffered a 50% cut in financial resources. Officially, Flona has a management plan and management council, but these are hindered by the occupants, who pressure for the reduction of the UC. The occupants of Flona fight in the Courts and in the Legislature for its repeal since its creation. They have strong political articulation and are referred to as “producers” in speeches by deputies and senators (Senado, 2008). Until 2015, a draft Legislative Decree (PDC No. 1.148/2008) was negotiated in the Chamber of Deputies to halt the effects of the decree creating the UC, that is, to repeal it. Although this bill was shelved in January 2015, the occupiers continued to pressure the Executive, as the President’s Chief of Staff took on the negotiations to resolve the conflicts in Flona. 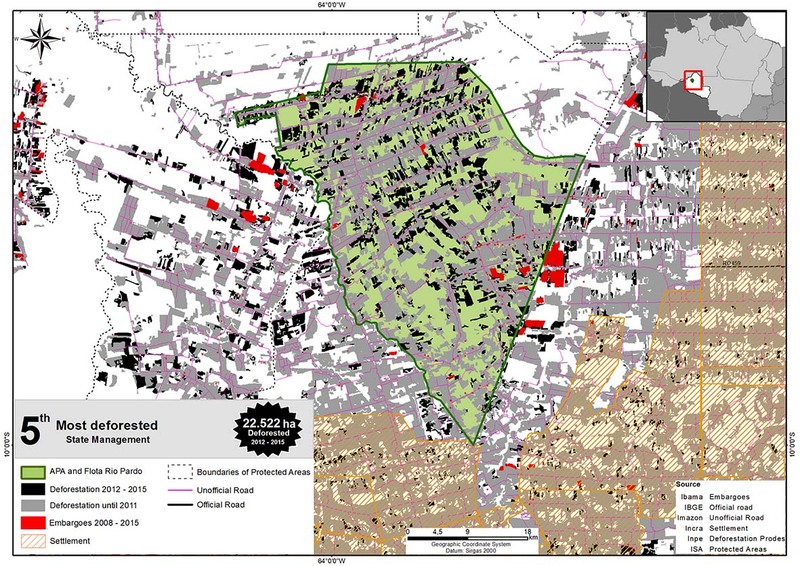 In July 2016, in a meeting with civil society organizations, the Minister of the Environment, Sarney Filho, said that ICMBio would be working on a proposal to transform the most preserved part of Flona in Parna and the most occupied area in APA. The Federal Prosecution Service in Pará (MPF-PA) tried to prevent the change of Flona. ​In August 2016, it recommended that the ICMBio immediately suspended the processing of any administrative procedure or demand aimed at recategorizing or revoking Flona Jamanxim (MPF-PA, 2016b). In November, before the refusal of ICMBio to follow this recommendation, the MPF in Itaituba initiated a public civil action to prevent it from changing the UC. However, on December, 20, the government published Provisional Measure (MP) No. 756/2016, which reduced Flona by 57%. 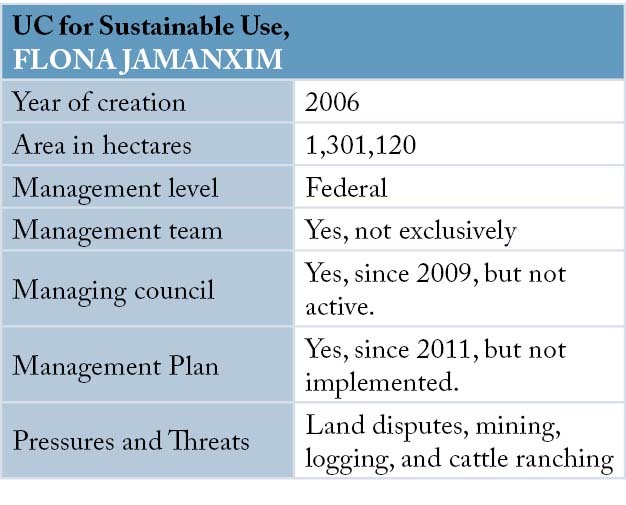 Out of the 743,540 hectares excluded, the government allocated 59% to Parna Rio Novo and 41% to the newly created APA Jamanxim. The 305,000 hectares allocated to APA allow the existence of private property and, therefore, land and environmental regularization of those who acted illegally. This area is 8.7 times larger than the area indicated for change by the ICMBio study (ICMBio, 2009). Now it is up to National Congress to confirm the change of Flona, ​​by transforming the provisional measure into law. Information obtained by email message on November 25, 2016. Writ of mandamus (mandado de segurança – MS) No. 2.6012, filed in the Federal Supreme Court in June of 2006. Legislative Decree Bill of the Chamber of Deputies (PDC) No. 2.224/2006 and PDC No. 1.148/2008. Public Civil Action No. 0001990-15.2016.4.01.3908. 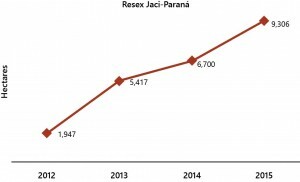 Resex Jaci-Paraná has already lost more than 30% of its forests (ISA, 2015b) and has shown an increasing trend of deforestation between 2012 and 2015 (Figures 16 and 17). It has been undergoing illegal logging and land invasion (Figure 16). 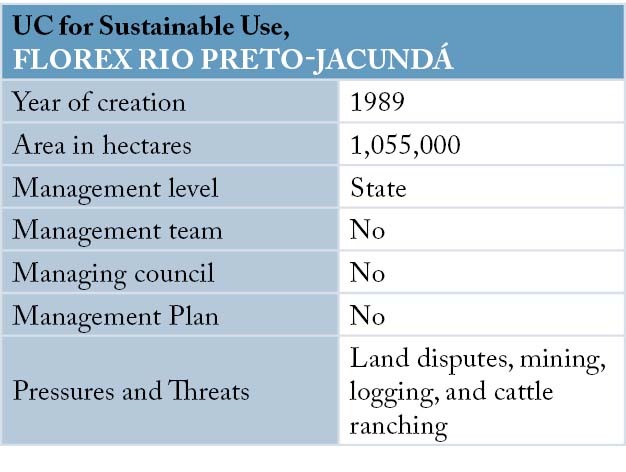 Veríssimo & Ribeiro (2007) had already pointed out, as the main causes of increased deforestation in the state of Rondônia, the lack of action by the state government to protect these areas and its proximity to logging centers and cattle ranches. The UC is marked by changes in limits and management omission. It was reduced eleven months after its creation, in 1996, when it lost approximately 14,000 hectares compared to its original area. 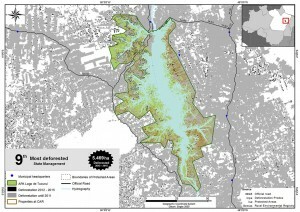 In 2011, the UC was again altered, with the exclusion of 2,240 hectares, for the formation of the Santo Antônio Hydroelectric Power Plant (HPP) and the inclusion of 6,130 hectares in relation to the previous area (191,234 hectares). This Resex has no management council and no management plan. As the 36 sustainable use UCs of Rondônia do not have an exclusive management team, the 52 employees of the Coordination of Conservation Units share their management activities. The MPE-RO and MPF have been fighting against the Resex invasion since 2004, when the invasions began to intensify and opened up about 8,000 hectares (4% of its area). The first action was against INCRA, IBAMA, the State of Rondônia and the municipalities of Porto Velho, Nova Mamoré and Buritis, aiming to curb invasions and deforestation in Resex and in three other protected areas. The Federal Court in Rondônia granted a favorable injunction in 2004 and a favorable judgment in 2013. However, federal, state and municipal governments have failed to comply with judicial decisions. On the contrary, local politicians have encouraged the invasion of this UC and others over the years (GTA, 2008; Escada et al, 2012). 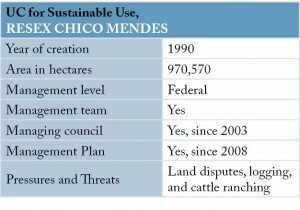 In 2007, the UC was already among the most deforested in the state (Cavalcante et al, 2011; Veríssimo & Ribeiro, 2007). In 2014, ten years after the first court decision, 34% of the UC area had already been deforested and the main activity of the invaders was cattle ranching, with an estimated herd of 44,000 head of cattle (Rondônia, 2014). That year, in compliance with the judicial decision of 2013, Sedam published a normative instruction to notify occupants to leave the UC, but the Legislative Assembly passed legislative decrees to extinguish Resex and three other UCs illegally occupied (The Eco, 2016). Again, the MPE-RO acted and the Court of Justice of Rondônia suspended the effects of the decrees in April 2014, through a preliminary decision, and through a final decision in May 2016, declaring them unconstitutional. Therefore, Resex Jaci-Paraná continues to exist. Currently, the MPE-RO is fighting to remove, with police force, the occupants who refuse to leave and force them to demolish buildings and restore the deforested areas, according to decisions of the Superior Court of Justice. In Porto Velho, the MPE-RO obtained a favorable decision in May 2016. However, a legal battle against an invader individually and not against the set of invaders does not assure the protection of the UC. In addition to the delay in obtaining a final unappealable judicial decision, these do not always favor environmental protection. For example, in April 2016, the Judge of Buritis decided to dismiss an action for the removal of an occupant. The action, regarding the constitutionality of the decree that repealed Resex had not yet been tried, and the judge understood that MPE-RO should await this decision, as it could result in harm to the occupant. In addition, the judge argued that so much time had passed between the undue possession of the area and the commencement of the lawsuit, that the dismissal of the action at that time would not bring harm to the parties. 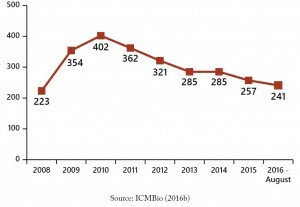 In the meantime, deforestation continues to increase in the UC, reaching more than 9,000 hectares in 2015 (Figure 17). Information obtained in a telephone conversation with a server of the Coordination of Conservation Units of the State Department of Environmental Development (Sedam), on November 30, 2016. Public Civil Action No. 2004.41.00.001887-3. Direct Action for the declaration of Unconstitutionality No. 0003755-58.2014.822.0000. See 2008 and 2009 Special Appeal (Resp) Decisions: REsp 863.939 – RJ (DJe 11.24.2008) and REsp 945.055 – DF (DJe 08.20.2009). Public Civil Action No. 0016894-74.2014.8.22.0001. Public Civil Action No. 0002747-46.2015.8.22.0021. About 60% of APA and Flota Rio Pardo area has already been deforested (ISA, 2015b) (Figure 18). Their deforestation rates have decreased in the last three years, but are still high (Figure 19). The UCs were created in 2010, based on a reduction in the degree of protection of the invaded part and the most anthropic part of Flona Bom Futuro (Figure 18). This reduction resulted from an agreement between the state government of Rondônia and the federal government for the licensing of the Jirau and Santo Antônio HPPs (Rondônia, 2009). Under the agreement, the government of Rondônia undertook to revoke and reduce state units affected by the HPPs, and the federal government agreed to stop the operation to remove invaders from Flona Bom Futuro and to exclude the occupied area (144 mil hectares) from its territory. Thus, in addition to creating the APA and the Flota Rio Pardo, without establishing the boundaries between them, the state of Rondônia revoked four other UCs. 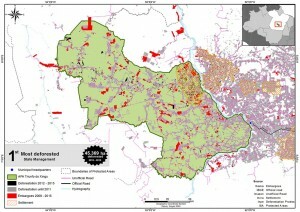 A clause in the agreement also provided for the altered area to be used for relocation of the “families that currently occupy the areas of the state UCs” (Rondônia, 2009), but this has not happened. 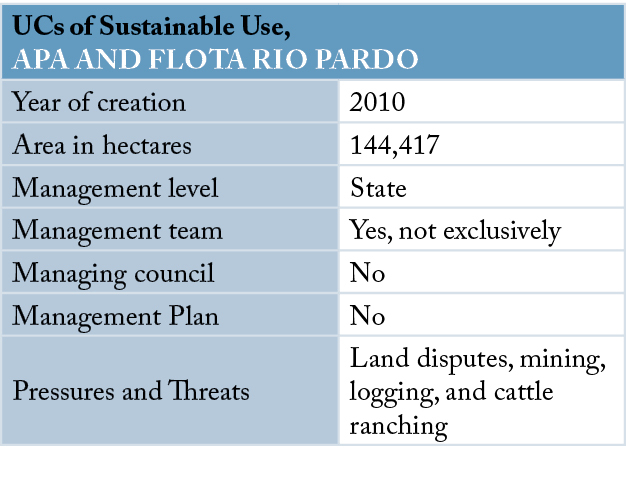 APA and the Flota Rio Pardo do not have an exclusive management team, nor a managing council or management plan. In practice, the state government has treated only as APA the area designated for APA and Flota Rio Pardo (Rondônia, 2013). 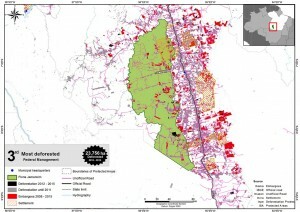 Therefore, in 2014, MPE-RO initiated a public civil action to demand the definition of the boundaries of these UCs and the activities permitted in each one of them, as well as the removal of occupants that do not fit the profile of being small rural producers or traditional population. 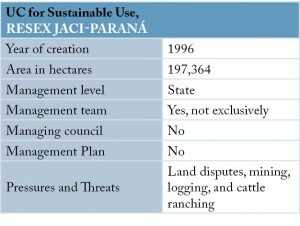 The objective is to combat land speculation, large land estates, the appropriation of public land by public servants and political agents (such as mayors and councilmen) and extensive cattle ranching, an activity that is incompatible with the environmental conservation and preservation objectives of UCs. In July 2015, there was a favorable ruling, and both APA and Flota Rio Pardo are currently being reformulated with respect to the redefinition of their limits. According to the MPE-RO, the part that should be Flota will return to the territory of Flona Bom Futuro. 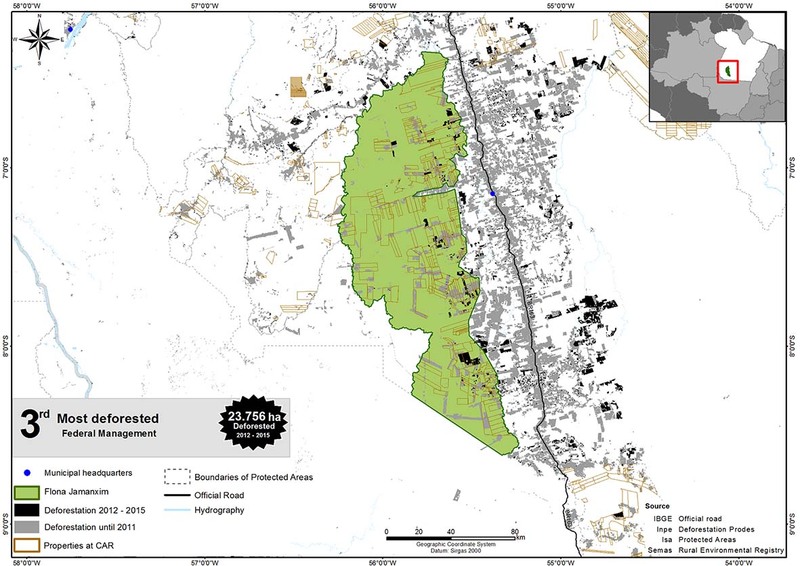 To this end, the environmental authority (Sedam) has already finalized a land survey of the area, but has not yet completed the process of redefining the boundaries. However, in reaction to this lawsuit, occupiers and local politicians are already pressing for the repeal of the APA and the Flota Rio Pardo. They propose an exchange: the revocation of these UCs and the creation of another of the same size, in an area to be obtained from INCRA (ALE-RO, 2016). Flota Rio Madeira A, Flota Rio Vermelho A, Flota Rio Vermelho B and Esec Antônio Mugica Nava. Public Civil Action No. 0017310-42.2014.8.22.0001, Judicial District of Porto Velho. Information obtained in a telephone conversation with the the State Public Prosecutor Aidee Maria Moser Torquato Luiz, on October 6, 2016. 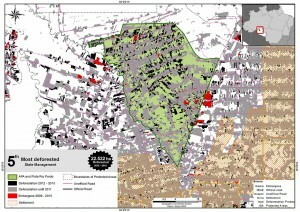 The southern part of Flona Altamira has been being deforested (Figure 20). However, there is a tendency for deforestation rates to decrease (Figure 21). The main pressures and threats to the UC are associated with land disputes, mining and cattle ranching, which are intensified with the opening of roads. The CAR map of this National Forest (Flona) shows great interest over forest areas (Figure 22). UC’s land tenure situation makes it vulnerable to irregular occupations and land grabbing. 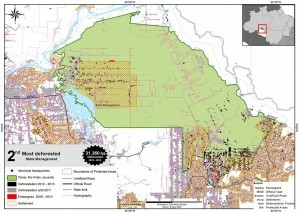 By the completion of its management plan, an analysis of its land situation had not yet been completed. However, a preliminary analysis found that there were no public lands collected, federal or state, within the limits of the UC. According to Incra, the Flona region was an empty space, without information on domains (ICMBio, 2012). In addition, Flona has a territorial area larger than the one declared in its creation decree. Until April 2011, ICMBio worked with a polygon of 760,000 hectares. In 2012, instigated by the UC advisory council, ICMBio reinterpreted its descriptive memorial and excluded approximately 37,000 hectares to the south of Flona. Coincidentally, the area removed is precisely the area with the greatest occupation and deforestation (Figure 20). The decree of creation of Flona Altamira has not yet been modified, but ICMBio already uses this change and has already published the new polygon of the UC on its website. However, the process for the rectification of boundaries, which aims at the publication of a new descriptive memorial, is still being handled by ICMBio and may or may not result in the exclusion of new areas. The rectification of the Flona boundaries will entail the adjustment of boundary areas of UCs and TIs, which used its descriptive memorial as a reference, such as Flota Iriri and TI Kuruáya. Considering the existence of this process, the fact that there has yet to be any change to the decree of creation of this Flona Altamira puts into doubt the legality of this process of boundaries revision. 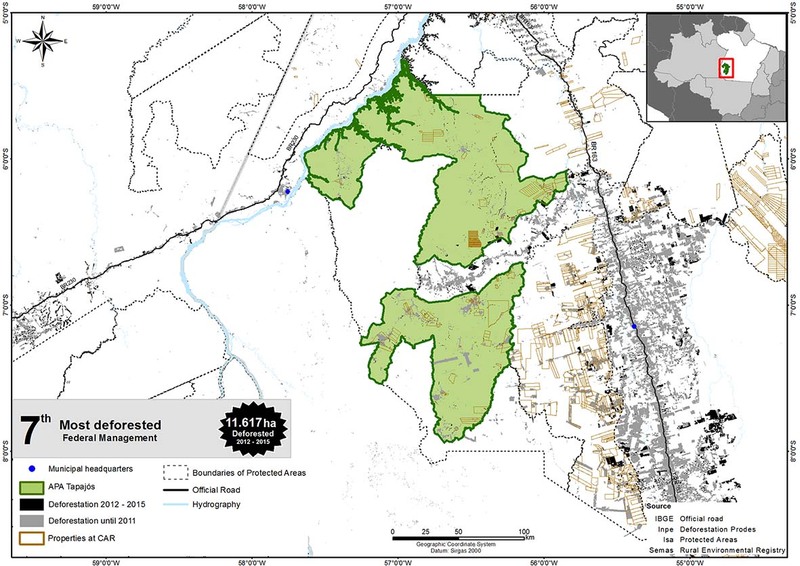 We used the original map of the UC, with about 760 thousand hectares, for the analysis of the 50 most deforested UCs between 2012 and 2015. 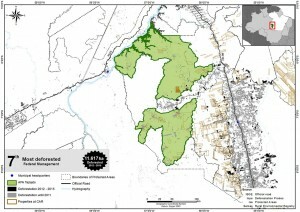 According to the UC manager, who is also responsible for Flona Jamanxim and Rebio Nascentes da Serra do Cachimbo, it is in the area of activity of the ICMBio Regional Coordination in Itaituba (CR-3), which has 25 analysts and three technicians to manage 12 UCs, which total 9.2 million hectares. The surveillance actions are carried out by only six people in CR-3, which in 2015 suffered a 50% cut in the budget. The reduction of deforestation in this Flona can be explained by the fact that there is an active managing council and a management plan in execution, and because about 50% of its territory is already under forest concession (MMA, 2015b). Information obtained by means of an email message from the Division of Consolidation of Limits – DCOL/CGTER/DISAT/ICMBio, on November 4, 2016. Information obtained by means of an email message from the Division of Consolidation of Limits – DCOL/CGTER/DISAT/ICMBio, on November 25, 2016. 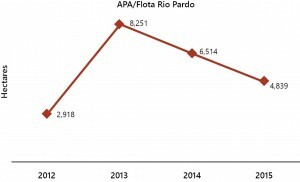 APA Tapajós is in an area under the influence of road BR-163 and it showed a tendency of increase in deforestation between 2012 and 2015 (Figures 23 and 24). It is divided by the Crepori road (Transgarimpeira) into two areas (Figure 23). Currently, the main pressures encompass the irregular mining activities and the disorderly occupation. 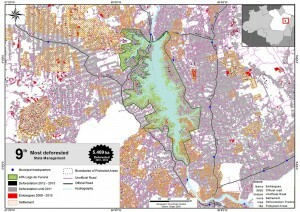 The UC’s CAR map shows dispersed occupations and some large land claims (Figure 25). The UC is located at Tapajós Mining Reservation and mining requests by companies and individual entrepreneurs involve more than 90% of its territory (ISA, 2015b). Practically 100% of APA’s gold mines are not licensed. 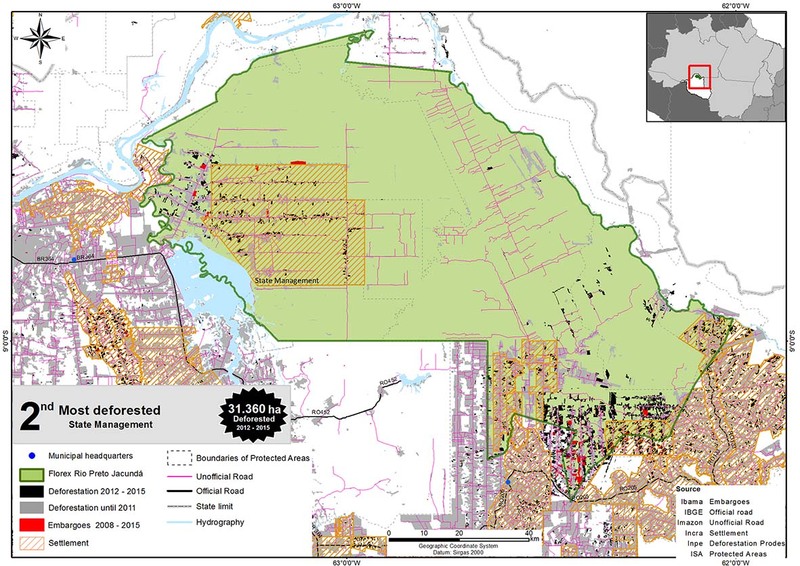 These pressures undermine its great potential for timber concessions. 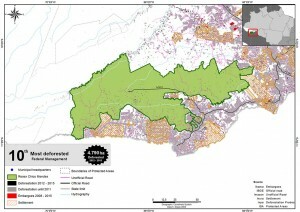 The Brazilian Forest Service (SBF, 2007) has identified this APA as a priority area for concession in 2007 because of the available wood stocks and their location, which would meet the demand of the municipality of Novo Progresso and the district of Moraes de Almeida (SFB, 2007). However, shortcomings in the UC management have not yet allowed the use of this potential. According to the manager, there are only three environmental analysts to manage the UC; a management council has been formed but is not active; and it does not yet have a management plan. The UC also does not have sufficient financial resources for its management and it is difficult to access several sites in its area. The manager also said that ICMBio is seeking resources and partnerships for the elaboration of the management plan by 2018, and that a possible resource would be environmental compensation from the licensing of mining fields. The manager attributes the lack of control over occupation and irregular mining activity to the lack of institutional guidelines and inter-institutional articulation to deal with these matters. However, there are some actions to change this situation. For example, in May 2016, the government of Pará created the Tapajós Working Group (GT-Tapajós) for the mining and promotion of sustainable actions in the Tapajós River region. In July 2016, MPF and MPE-PA issued a recommendation to several public bodies to adopt measures to legalize mining activities in the Tapajós basin (MPF-PA, 2016a). If the causes of deforestation are not addressed, the APA situation will tend to worsen with the investments in infrastructure in the region, considering the direct and indirect impacts they cause and the migratory movements they generate. The APA boundaries have already been altered due to some infrastructure works planned in the region. In 2012, the APA was reduced by approximately 20 thousand hectares to make feasible the construction of Jatobá HPP. 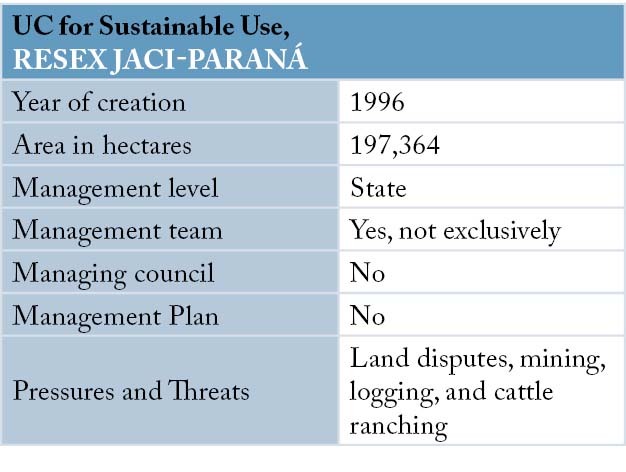 In December 2016, 51,131 hectares were excluded from the APA and attached to Parna Jamanxim as a way to compensate for the area excluded from that Parna for the construction of a railroad. Order of the Ministry of Mines and Energy No. 882/1983. Information obtained during a meeting with the ICMBio Management Committee on July 28, 2016. Information obtained by email message, on August 3, 2016. Provisional Measure No. 558/2012, transformed into Law No. 12,678/2012. Provisional Measure No. 758 of December 19, 2016. 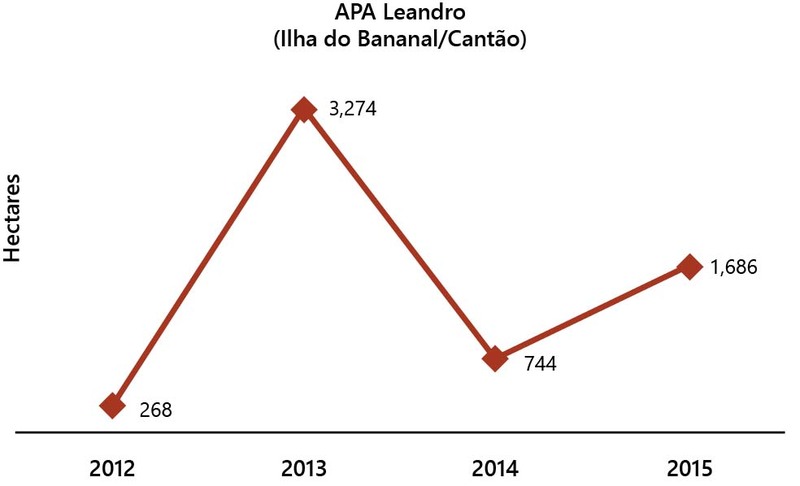 APA Leandro or Ilha do Bananal/Cantão is the largest UC in the state of Tocantins where deforestation has shown a tendency to increase between 2012 and 2015 (Figures 26 and 27). It is located in the Cantão region, which makes the transition between the biomes Amazonia and Cerrado and serves as a buffer zone for PES Cantão and Parna Araguaia. The occupation process is accelerated in the region, and the APA suffers from predatory hunting and fishing, illegal logging and burning, mainly in settlements. 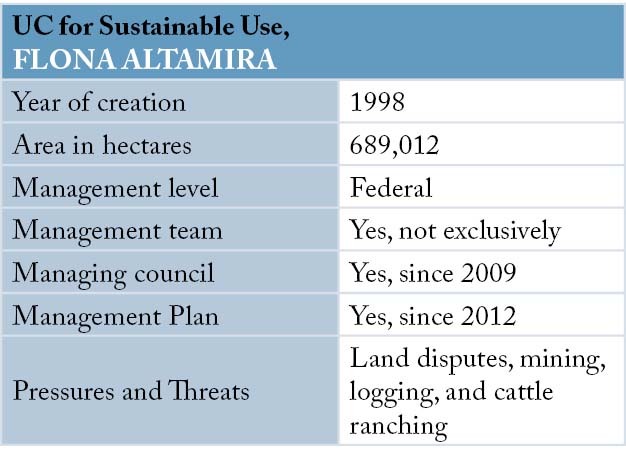 Most of the deforestation in APA occurred in 2013 (Figure 27), for two reasons: the increase in the migratory flow to the UC between 2012 and 2013; and the approval of State Law No. 2.713/2013, which instituted the Environmental Adequacy Program for Property and Rural Activity (TO Legal) and exempted environmental licensing for all enterprises classified as carrying out agroforestry activities (crop, livestock and forest). 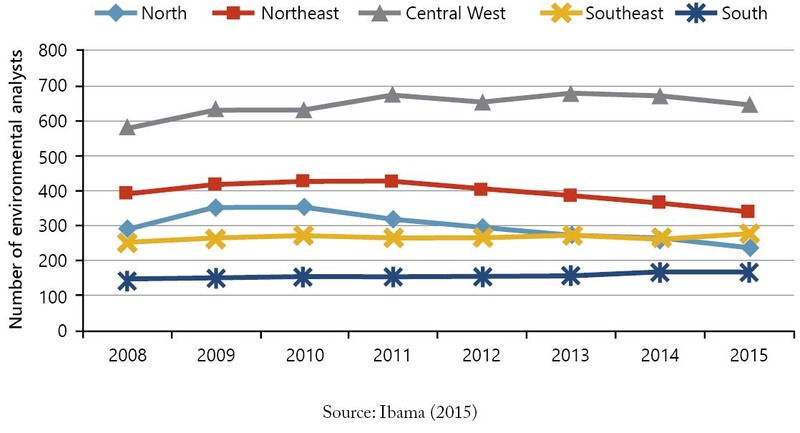 Between 2014 and 2015, this APA had the highest number of fire outbreaks among all UCs in the country (Vieira, 2015). According to its manager, this APA is mainly occupied by small producers and fishermen. The APA management plan was prepared in 2000, but was never implemented because the managing council was inactive until 2015, and when it resumed, its approval was refused on account of outdated information. Moreover, according to the manager, the Nature Foundation of Tocantins (Naturatins) had already hired a specialized company to review the management plan. The surveillance actions in the UC happen according to an established schedule and when there is a complaint, but the lack of field agents prevents periodic actions. The Federal Prosecution Service in Tocantins (MPF-TO) and the Prosecutor General’s Office (PGR) understood that the state of Tocantins, by exempting environmental licensing for enterprises classified as carrying out agroforestry activities, violated the Federal Constitution and extrapolated legislative competence (MPF-TO, 2015). Thus, PGR filed a Direct Action for the Declaration of Unconstitutionality (ADI No. 5.312) and sought an injunction to suspend the effects of the provision until final judgment of the action. Despite the required emergency measure, the lawsuit still awaits the decision of the Federal Supreme Court since January 2016. Meanwhile, the National Congress may resolve the issue sooner because it is about to vote on a bill (PL No. 3.729/2004) that exempts licensing for agricultural activities and planted forests. This is not the first time that the state of Tocantins has tried to disengage from an obligation of environmental protection. In 2005, the state government proposed to the Legislative Assembly the reduction of APA Leandro claiming that it did not have the means to control the agricultural borders and that it would also attend requests from the leaders of municipalities involved (MPF-TO, 2005). The UC was reduced to 11% of its original area (Law 1.558/2005). However, MPF-TO was able to reverse the reduction by a judicial decision, which suspended the effects of the altering law. The federal judge based the judgment on the absence of technical studies and public hearings with the broad participation of society, as well as on principles such as precaution. The Federal Regional Court of the 1st Region (TRF1) confirmed this decision, recognizing that it was sound and in line with the precautionary principle. Information obtained by telephone conversation with the manager on July 28, 2016. 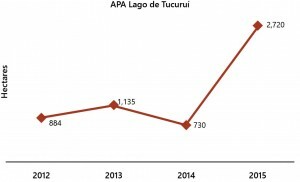 About 60% of the APA Lago de Tucuruí area has already been deforested (ISA, 2015b) and deforestation showed an increase tendency between 2012 and 2015 (Figures 28 and 29). 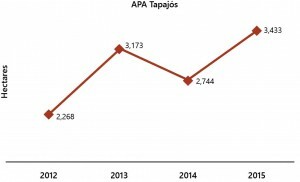 Between 2014 and 2015 deforestation rates increased by 273% in the APA, reaching almost 3 thousand hectares (Figure 29). The UC is formed by the banks of the lake of Tucuruí HPP, built in 1984, and by the more than 1,600 islands that emerged from the flooding of the lake area (Figure 28). 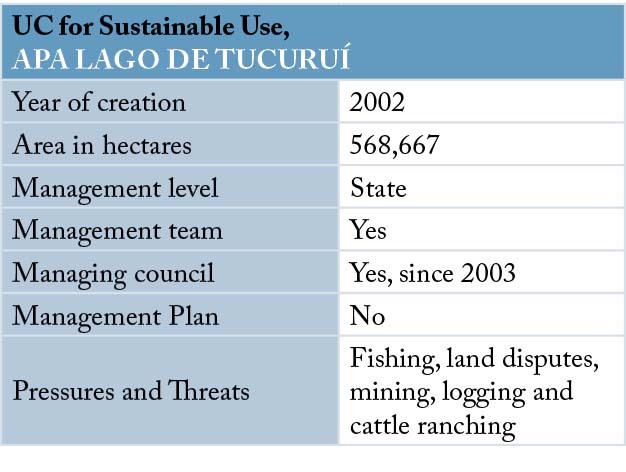 The main pressures and threats to the UC are predatory fishing, illegal logging and deforestation for crop and pasture formation (Ideflor-bio, 2015b). Cattle ranching has led to deforestation on the margin areas of the lake, and, depending on the size, on the islands as well (Jatoba, 2006). According to the management team, the land issue of the area is uncontrolled and there is still no forecast for completion of the land survey. 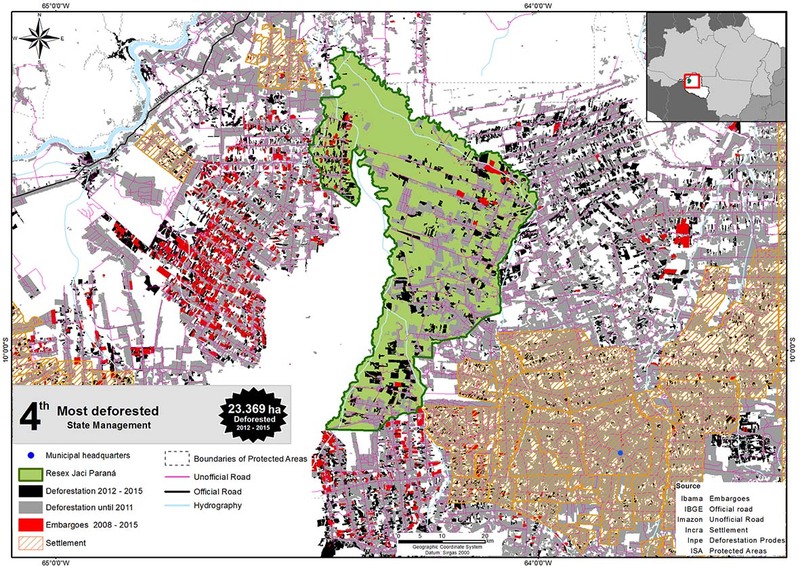 The APA manager estimates that approximately 30 thousand families live in the UC (Ideflor-Bio, 2015b), and further, there are many properties registered in CAR (Figure 30). 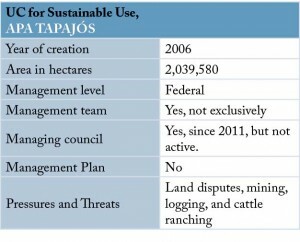 During an extraordinary meeting of the APA managing council in April 2015, the UC manager attributed the high deforestation to the limitations of management: i) the absence of a management plan; ii) insufficient staff, taking into account quantitative and technical ability; and iii) deficiency of equipment to perform surveillance, monitoring and environmental education actions (Ideflor-bio, 2015b). 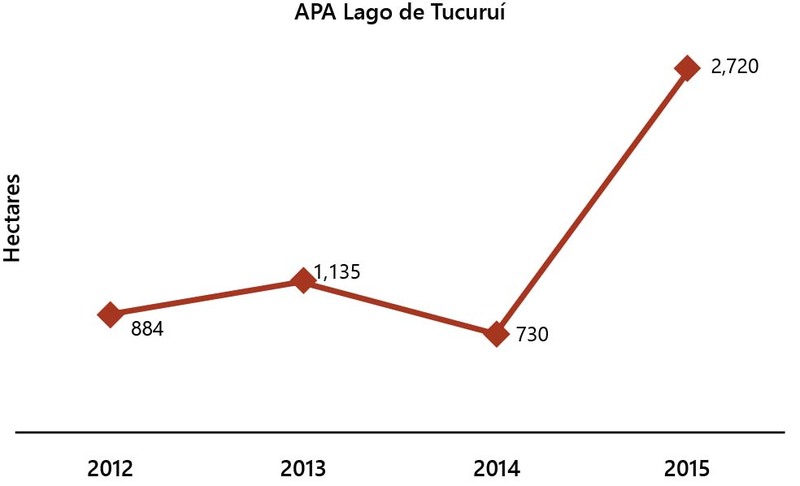 It is surprising that APA Lago de Tucuruí faces such management problems, since it received environmental compensation resources. In July 2015, it had approximately R$ 13 million in financial resources derived from environmental compensation for the construction of the HPP and its navigation lock-system (Ideflor-bio, 2015c). The management team argues that they face difficulties in utilizing these resources, since, once deposited in a state account, they are considered public and must follow the rules of public procurement law. However, they informed that their priority is the preparation of the management plan by the end of 2017. They also affirmed that, at the end of 2015, trucks, motorboats and other equipment were purchased to assist in the surveillance actions. Information obtained by means of a telephone conversation with the team manager of APA Lago de Tucuruí on August 12, 2016. 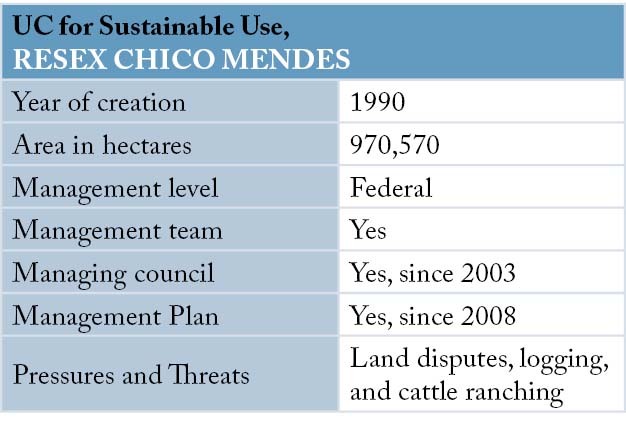 Resex Chico Mendes was one of the first federal extractive reserves to be created and is the largest in Brazil (Figure 31). 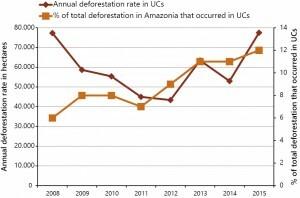 There was a tendency for the reduction of deforestation in the UC, between 2012 and 2014, but in 2015, deforestation grew 50% compared to the previous year (Figure 32). The proximity of road BR-317 favors illegal occupation, illegal logging and cattle ranching within this UC. 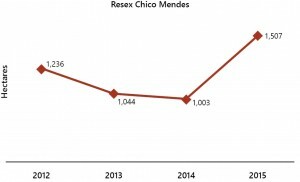 Resex is home to about 10,000 people, but the residents’ association estimates that 10% of this population are illegal occupants (Globo Rural, 2015). It is possible that the increase in deforestation in the UC in 2015 is a result of activities carried out in irregularly occupied areas. The UC management team consists of only three people, and the management plan is out of date, with no provision for updating. The managing council is active, however, there were no meetings in 2016. Surveillance actions occur periodically, when there are complaints and in some large operations; however, the lack of personnel and financial resources makes it difficult to carry out these and other actions within the UC. There are almost 90 cases for the judgment of infractions in the reserve, ten of them aim at the removal of illegal occupants. Information obtained through a telephone conversation with the UC manager, on August 12, 2016. Critical UCs, especially the top 10 in the ranking, are those most accessible and vulnerable to threats arising from expansion of the agricultural frontier and infrastructure projects. The vulnerability of these areas stems from failures related to four factors necessary for the success of any enterprise: strategy, personnel, financial resources, and implementation. To ensure the protection of UCs and the achievement of their objectives, the government would have to have a clear and consistent view of its role in the development and protection of the region. As a result of the lack of commitment to protection, the government yields to pressure to change rules and weaken environmental legislation according to current interests. The changes in protected areas, amnesty to illegal deforestation prior to July 2008 (reform of the Forest Code) and the commitment to end illegal deforestation only in 2030 send a message of tolerance and impunity to those who deforest and appropriate public goods. In addition, government actions to protect UCs have focused on surveillance, but lack other components such as land regularization and revenue generation. The state and federal governments still do not have a plan for the land regularization of Amazonian UCs. In the meantime, irregular occupants of protected areas gain economic and political power and begin to push for changes. Currently, there are hundreds of bills in National Congress to alter and weaken the degree of protection of UCs and TIs across the country (Ortiz, 2013; Martins et al, 2014). 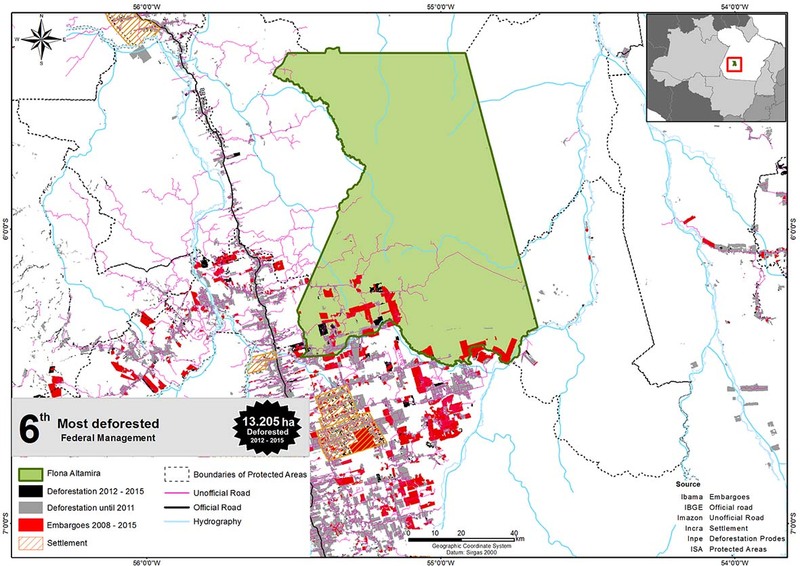 Recently, parliamentarians from Amazonas sent a bill to the Planalto Palace with a proposal to reduce, by 65%, the area of five UCs created in the south of that state in 2016 (Estadão, 2017). These bills and the actual reductions of UCs give hope to irregular occupants in the UCs and stimulates new invasions and deforestation. 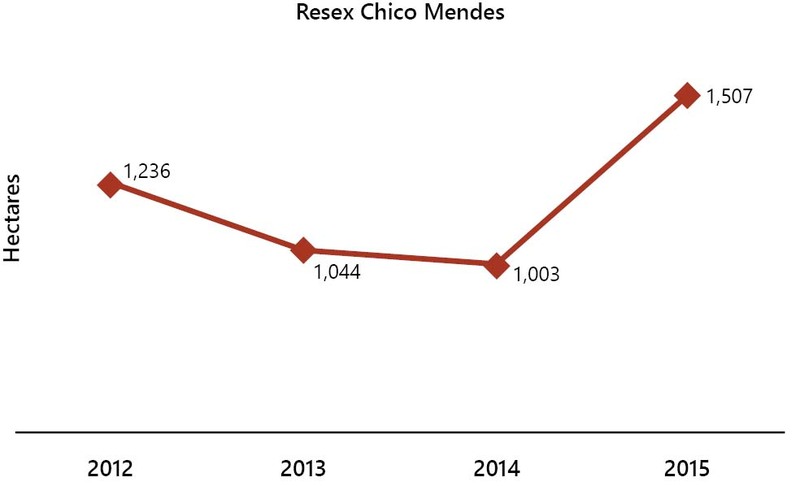 It is remarkable that the increase in deforestation in Rebio Nascentes of Serra do Cachimbo in 2015, next to Flona Jamanxim, was 355% higher than in 2014. The occupants of Rebio believe they may take advantage of the negotiations to change Flona Jamanxim or that they will be next to benefit from a similar change. UC alterations increase the deforestation rate of the Amazon, as it tends to grow 50% in areas that lose UC status or in areas where the degree of protection favors occupations (Martins et al, 2014). 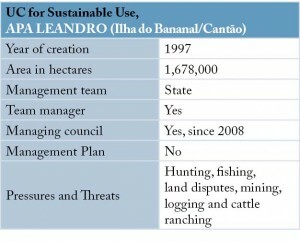 There are insufficient human resources to meet the needs of effective management of the UCs in the Amazon. In 2013, the TCU warned about the shortage of personnel in the Amazon UCs, noting the prevalence of federal UCs with only one or two public servants (TCU, 2013). In August 2016, there were 241 analysts (Figure 33), 40% less than in 2010 (ICMBio, 2016b), According to public servants, many leave their positions in the Amazon for reasons such as: i) difficulty in adapting; ii) lack of conditions for work, including physical security; iii) lack or precariousness in the provision of basic public services at locations, such as health and education; iv) they feel obligated to perform functions they are not suitable for, such as field surveillance; v) accumulation of incompatible functions such as environmental education and field surveillance, etc. Each environmental analyst working in the north of the country must take care of 309,625 hectares, an area 35 times larger than that managed by an analyst in the Southeast. For equivalence in the North and Southeast regions, 7,140 analysts would be necessary, or 35 times the current amount. 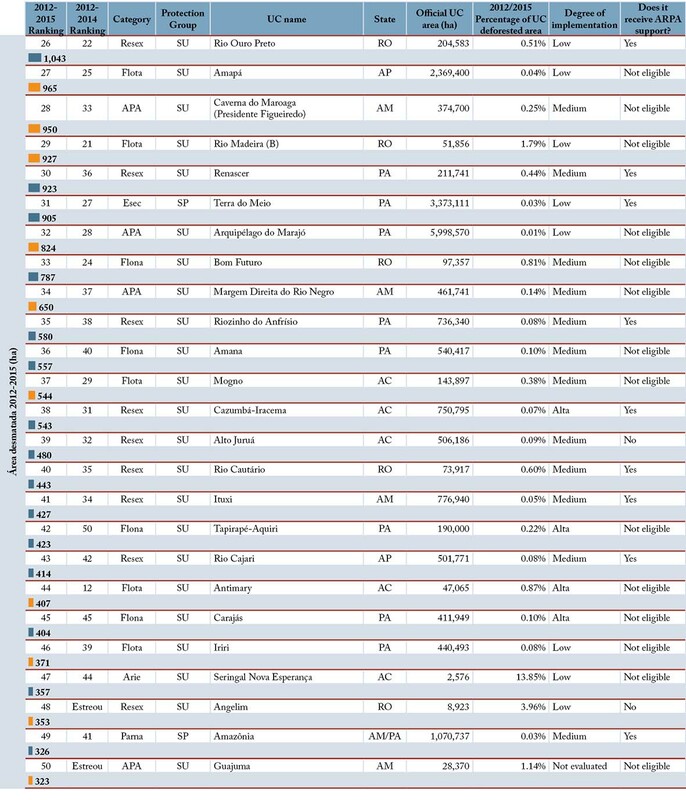 See the number of environmental analysts in all regions of the country in the Appendix. If the situation at the federal level is difficult, in the states it is even more critical as they have increasingly less budgetary resources to provide UCs with the human resources required (TCU, 2013). Ibama, in the Legal Amazon, also has fewer environmental analysts to assist in the control of UCs compared to the rest of Brazil (Ibama, 2015). 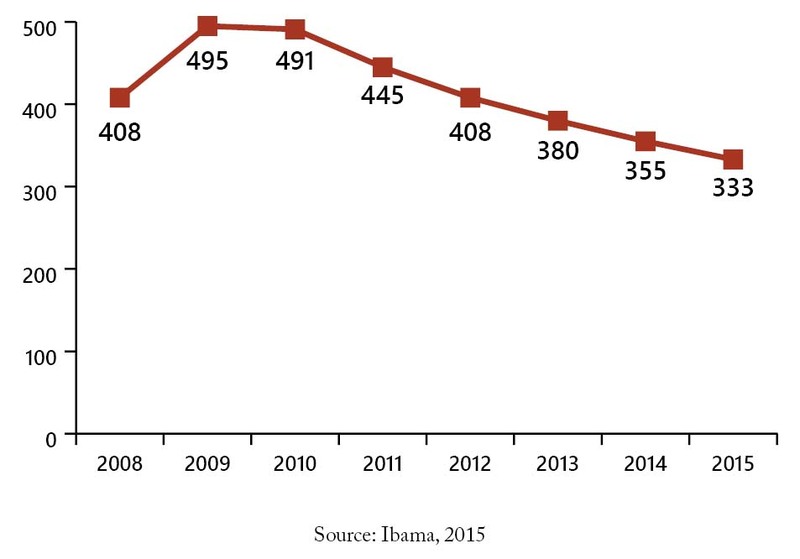 Between 2009 and 2015, Ibama reduced the number of environmental analysts in the region by 33% (Figure 34). This occurred because the agency closed several regional offices as of 2011. It is important to emphasize that since the publication of Complementary Law No. 140/2011, which specified the powers of federal entities in environmental licensing, the government began to demand more action from states and municipalities in the monitoring of illegal deforestation (Nublat & Miranda, 2013; MMA, 2015a). 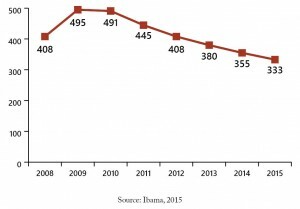 Recently, Ibama’s chiefs of surveillance attributed the increase in deforestation over the past two years to successive investment cuts, a weakening of the environmental legislation, and the lack of public servant examinations to rebuild civil servant staff (IBAMA’s chiefs of surveillance, 2016). This situation may have worsened given that in 2016 three administrative rules by Ibama determined the closure of 89 bases throughout the country, with 48% being in the Legal Amazon. Ibama Administrative Rule No. 11/2016, published in the Official Gazette (DOU) of May 2, 2016; Ibama Administrative Rule No. 31/2016, published in the DOU of September 30, 2016; and Ibama Administrative Rule No. 36/2016, published in the DOU of December 8, 2016. The UCs in the Amazon lack the resources to invest in infrastructure, equipment and territorial consolidation (land regularization, demarcation and signaling). In order to perform these tasks (except land regularization), in the 16 federal UCs with low and medium degree of implementation identified in this study, it would be necessary to pay R$ 10.6 million, annually. 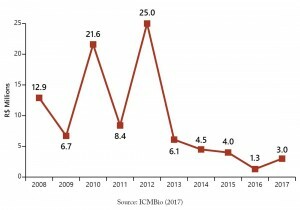 This figure is 3.26 times higher than the average of ICMBio investment resources between 2014 and 2016 for the whole country and 3.42 times greater than that projected for 2017 (Figure 35). In addition, efforts to collect revenue through alternative instruments such as visitation, forest concession, Ecological ICMS, among others, have been insufficient (Muanis et al, 2009). For example, the federal government is providing visitor support services in some UCs, but none of the priority UCs for 2016-2018 are from the Amazon biome (ICMBio, 2016d). An elaborated management plan and the regularization of the land situation are among the priority criteria for the concession of these services (ICMBio, 2016c). Another example is forest concessions, which occurs in only six of the 32 Flonas of the Amazon (SFB, 2016). We considered the need for an average investment of R$ 3.3 million over a five-year period, or R$ 660,000.00 per year to consolidate an UC without visitation, as estimated by Muanis et al (2009). In addition to scarce resources, the management of UCs has been marked by ineffective execution, which results in poor financial execution, slowness in the resolution of land and environmental conflicts, and low enforcement of environmental penalties, which are detailed below. 4.4.1 Low application of available financial resources. Between 2009 and 2014, ICMBio utilized only 35% of the R$ 218 million received for environmental compensation (Oliveira et al, 2015). The low application of these resources is due to the lack of political priority to regulate the technical, administrative and operational processes for the use of the resources; and the insufficient number and capacity of human resources (Oliveira et al, 2015; Muanis et al., 2009). In addition, Oliveira et al. (2015) point out that the low application of environmental compensation resources reflects the slowness and complexity of land tenure regularization processes in UCs, since resources are primarily invested in this matter. Another situation that may hinder the application of these resources is the recent decision of the TCU to prohibit the ICMBio from receiving and applying the resources derived from environmental compensation, and which determined that all resources already passed on to the public authorities must be included in the Single Account of the National Treasury and follow the same rules of execution of the public resources (TCU, 2016). Thus, the application of the more than R$ 200 million already deposited must become even more time consuming due to the public procurement rules and procedures to be observed, which impairs the payment of actions already carried out by contractors based on the use of those resources. The omission and/or slowness of governments and the Judiciary in dealing with irregular occupation of public lands stimulates and perpetuates the problem. The rules on the possession of public lands in Brazil are confusing and the Judiciary is slow and not uniform in its decisions (Barreto et al, 2008; Araújo & Barreto, 2015). This continues to occur even though the Superior Court of Justice has already ruled that those who occupy public areas are not entitled to compensation for improvements that they have built, even if the occupation occurred in good faith. Otherwise, the government could solve the problem more quickly by choosing to repossess public lands and evict occupants. However, this decision is avoided because of the high political cost in areas where the population is heavily dependent on the economy generated by illegal activities and the potential discontent among voters and campaign financiers. In a recent report from Globo Rural (2016), a land-grabber stated that the occupation of public land is a worthwhile gamble, because “in Brazil no one takes anything from anyone”, and he considers himself a winner because he worked on the land for a long time without suffering any loss, and he even made a profit. Surveillance without effective punishment is not able to stop deforestation in UCs. 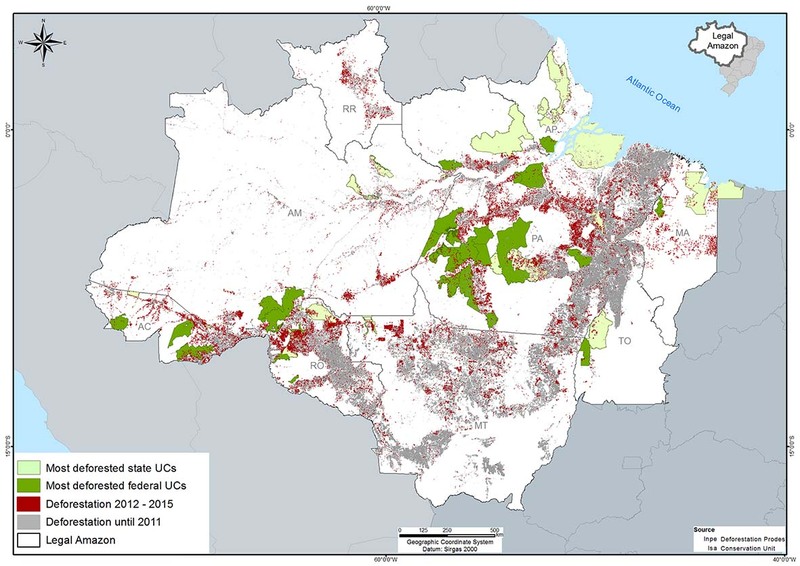 Public authorities have monitored deforestation in the 10 most deforested UCs in the Amazon region, as shown by the embargoes on the UCs’ maps. However, the lack of enforcement of penalties weakens the effect of surveillance. According to Shmitt (2015), the effectiveness of surveillance is low because: i) decision on administrative processes is slow, with only 26.3% of the analyzed cases having been decided in the first instance, within an average period of 2.9 years, which could lead to the statute barring of environmental crimes; ii) the collection of fines is low – only 10.1% were paid and corresponded to only 0.2% of the total value applied; iii) the seized goods remain with the environmental offenders themselves as faithful custodians in about 75% of cases; and iv) the embargoed areas may be disrespected, since there is no systematized procedure to monitor them. Impunity reinforces the power of criminals who intimidate and even kill defenders of environmental and agrarian rights, such as community members, environmentalists and even public agents (CPT Nacional, 2015; Ibama, 2016b). In 2015, Brazil was the country with the highest number of deaths of environmental and agrarian activists in the world (Global Witness, 2015). In addition, impunity generates a local economic dependence on illegal activities that makes it even more difficult to combat illegality (Globo Rural, 2016). These amounts are collected from companies to compensate for damages resulting from large projects that receive an environmental license. He analyzed approximately 12,000 infraction records carried out by Ibama related to infractions against the flora in the Amazon between 2008 and 2013. 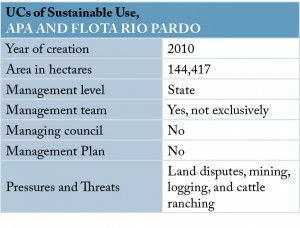 5. Who can protect the Conservation Units of the Amazon? The Amazon deforestation has increased due to actions and omissions of the public authorities and private companies. Thus, to eliminate deforestation and ensure effective protection of UCs in the long term, it will be necessary to build a consistent strategy, provide human and financial resources, and improve effectiveness. 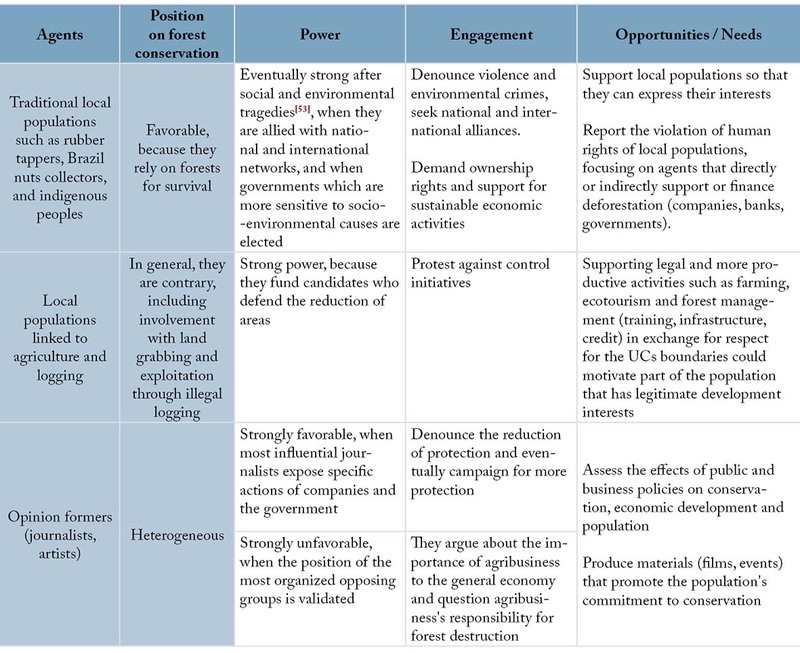 However, it is unlikely that the leadership to carry out these tasks comes solely from the government, since part of it clearly acts against the public interest, which results in weak indicators, not only in the environmental area (Table 1). International experience shows that conservation in the long run, whether through protected areas or other measures, resulted from the vigorous and continuous involvement of popular movements, conservationists, politicians, artists, entrepreneurs, journalists, religious figures, liberal professionals, and others. 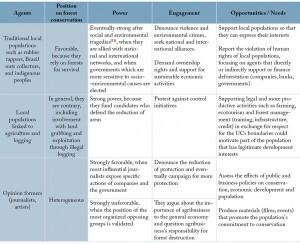 Engagement involved diverse motives, such as reducing environmental impacts, protecting strategic resources for socioeconomic development, and maintaining the source of associated emotional experiences, for example, scenic beauty and belonging to a place (patriotism, nationalism). There is potential for stronger involvement in conservation in Brazil. Opinion polls show that 91% of Brazilians are favorable to forest conservation (MMA, 2012) and that another 91% are proud of the country, motivated to a large extent, by its natural beauty (Agência Estado, 2007). 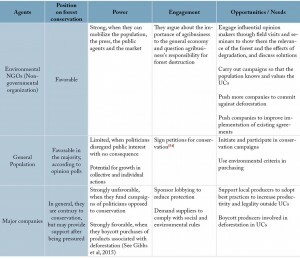 The example of the Greenpeace campaign that secured 1.4 million signatures to support a zero deforestation bill (Greenpeace, 2016) demonstrates the potential of mobilization. Next, we explore examples of opportunities to intensify the engagement of various agents in favor of UCs and the reduction of deforestation in general. Table 1 summarizes the opportunities. The State that takes away from society more than it gives to society is predatory. Analysts such as Evans (1989), for example, argues that the Brazilian state shows an intermediate level of predatory behavior compared to other countries (Japan, a State that supports development, and Zaire, a highly predatory State). Several indicators show the lack of interest on the part of the elite public authorities in the development of Brazil. In 2013, among the 30 countries with the highest tax burdens, Brazil had the worst return on well-being (G1, 2015), which contributes to the lack of basic sanitation for half of the homes, to the high rate of violence, and poor performance in education, among others. According to Evans, the predatory state characteristic in Brazil is associated with the strong public presence of subjects seeking short-term benefits, since they do not have long-term career incentives (for example, the large number of employees who are politically appointed). However, at the same time, Evans (1989) analyzes that there are some nuclei of efficiency in the public sector made up of officials who are recruited on merit, are autonomous, well paid, and have a clear career plan. For this reason, the success of initiatives to promote the public good in the long run will depend, to a large extent, on society’s support for the efficiency nuclei in the public sector. For example, actions of the Public Prosecution Service, Ibama, the Federal Police and the Federal Revenue Service (See MacAlister, 2008; Arima et al, 2014). Local populations in the Amazon, such as indigenous and rubber tappers, have fought and continue to fight to create protected areas, just as it happened in other countries (Calegareet et al, 2014). However, some of these populations have been subjected to intimidation and even violence, including killings (Global Witness, 2015). In this way, it is necessary to protect them so that they can ensure the protection of their areas. 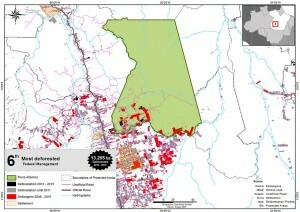 In addition to police action, social and environmental NGOs, governments and international and national donors could increase support for these populations and implement the areas based on the experiences of the PPG7 (Program for the Protection of the Rainforests of G7), which allowed the homologation of 29 million hectares of Indigenous Lands, the establishment of 2.1 million hectares of Extractive Reserves; and of the Amazon Protected Areas Program (Arpa) (MMA), [200-? 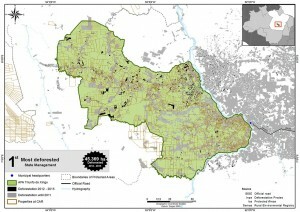 ]), which enabled the creation of 32.3 million hectares in UCs areas in the Amazon (Arpa, [2016?]) and supports long-term implementations (FUNBIO, 2015; Brasil, 2015; Amazônia Fund, [2016?]). Religious movements have participated in various initiatives to support forest peoples (Calegare, 2014; Catholic News Service, 2009). Religious leaders and their followers could step up support for conservation based on Pope Francis’s Encyclical Letter (Catholic Church, 2015), which calls for forest conservation as part of the effort to care for the common home (the planet), together with the Episcopal Commission for the Amazon of the National Conference of Bishops of Brazil (CNBB, 2015). 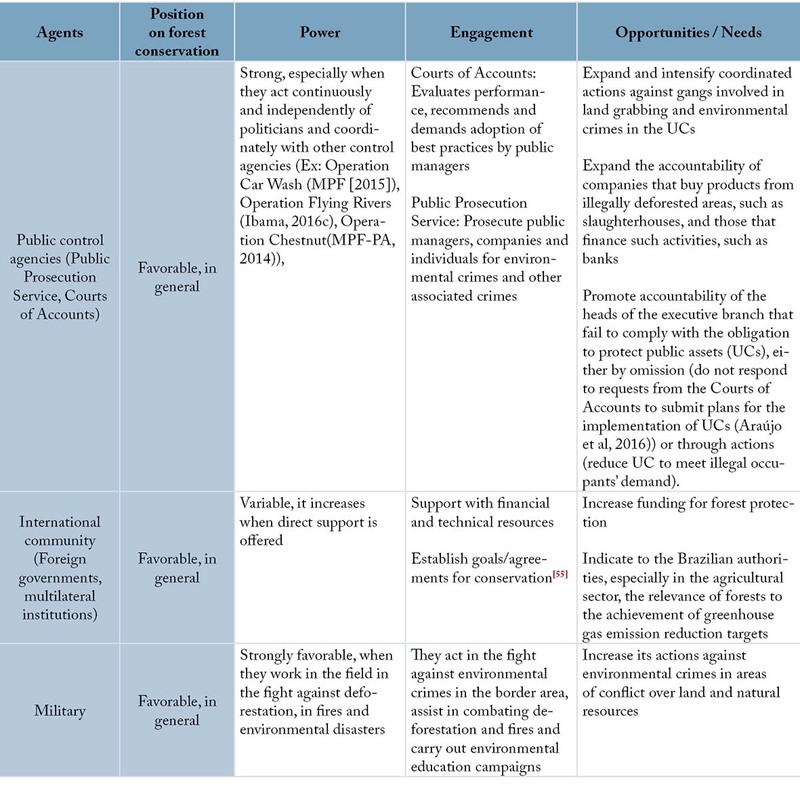 The actions of the military forces, in combating deforestation and illegal land grabbing, could be intensified in the areas of greatest conflict, within the National Defense Policy (Brazil, 2005). They form part of the National Council for the Environment and cooperate with environmental agencies, providing logistical support in environmental monitoring activities (Menin, 2007). The approval of Bill No. 7.422/2014, which aims to recognize the Military Police as a sectional body of the National Environmental System (Sisnama) (Xavier, 2016), could increase the effectiveness of their action by allowing all Military Police to issue records of environmental violations. In addition, control bodies such as the Public Prosecution Service and the Courts of Accounts could adopt measures that would have a broad systemic effect in defending UCs as public assets. For example, it would be plausible for the Public Prosecution Service and the Courts of Accounts to seek accountability from public managers who reduce the area or degree of protection of UCs to meet the demands of illegal occupiers that rob public patrimony (in the case of Flonas Jamanxim and Bom Futuro and Resex Jaci-Paraná), based on the Law of Responsibility of the President of the Republic and of the Ministers of State and the Administrative Misconduct Law. Indeed, it is surprising that this has not yet happened. Some companies have boycotted Amazon products associated with deforestation when under pressure from legal measures (Cattle Term of Adjustment of Conduct – TAC) and environmental campaigns (Soy Moratorium), which resulted in reduced deforestation in areas directly affected (Gibbs et al, 2015; Barreto & Gibbs, 2015). In addition, banks reduced financing that stimulated deforestation after a determination of the National Monetary Council (CMN) (Assunção et al, 2013). 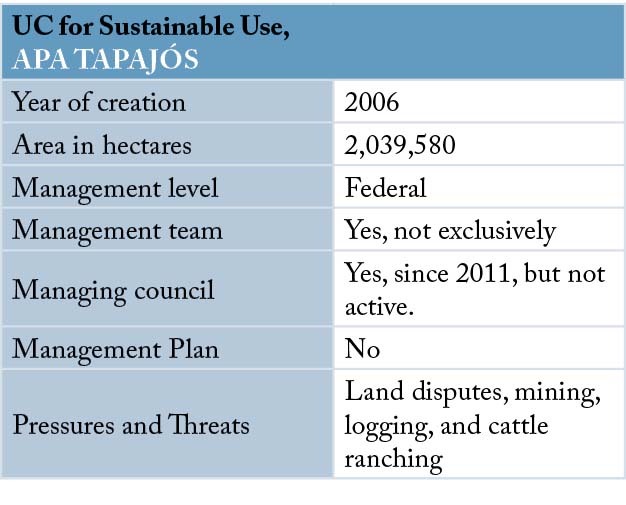 However, deforestation continues because of the shortcomings of these initiatives (Gibbs et al, 2015; Barreto & Gibbs, 2015), and because only a portion of the companies signed commitments. For example, 50% of the slaughterhouses with state (SIE) and federal (SIF) registers in the region did not sign commitments against deforestation (Pereira et al, in press). In addition, in October 2016, Ibama fined Banco Santander, under the charges of having financed soybean plantation in an illegally deforested area (Rodrigues, 2016), which shows that financing may still be stimulating deforestation despite banks declaring their commitment to sustainability (MMA, [2009?]). Therefore, it is opportune to increase the pressure against companies so that they improve and amplify their commitments in favor of sustainability. To this end, the Public Prosecution Service and the environmental agencies could increase the responsibility of companies that buy products originating from illegally deforested areas, such as slaughterhouses, and those that finance such activities, such as banks and grain traders. Another opportunity is to monitor Implementation of Resolution No. 4.327 / 2014 (Bacen, 2014), which requires that financial institutions and other institutions authorized to operate by the Central Bank of Brazil establish and implement the Social and Environmental Responsibility Policy (PRSA). NGO campaigns and investigative reporting on law-breaking companies could strengthen the actions of the Public Prosecution Service and environmental agencies and protect companies that comply with laws and agreements from unfair competition. In addition to boycotting illegal production, it is essential to stimulate sustainable production in areas already deforested outside UCs. Pressure on the market for products derived from illegally deforested areas begins to stimulate market and financing for sustainable production (TFA2020 & WEF, 2017 ). Meanwhile, public credit directed exclusively to the most sustainable practices in Brazil (ABC Program – low carbon agriculture) will represent only 1.6% of the country’s total rural credit in the 2016-2017 Agriculture and Livestock Plan (Mapa, 2016). According to TFA2020 & WEF (2017), the financial sector could help scale up sustainable production initiatives by engaging more strongly with governments, producers and supply chain partners (such as traders, slaughterhouses, supermarket chains) to identify opportunities and to eliminate barriers. Several approaches could sustain conservation in the long run. Engagement will tend to be stronger when involving sensory and emotional experiences such as tourism, educational expeditions, artistic and sporting events. Such activities could strengthen the regional economy and create a virtuous cycle – the UCs would increase tourism which, in turn, would increase the desire to conserve. It is estimated that tourism in UCs already moves approximately R$ 4 billion per year, generates 43 thousand jobs and adds R$ 1.5 billion to the Gross Domestic Product (GDP) (Portal Brasil, 2017). The economic opportunity is promising, since the richness of Brazil’s natural resources is the country’s most valued item according to the ranking of the Travel and Tourism Competitiveness Index produced by the World Economic Forum (WEF, 2015). 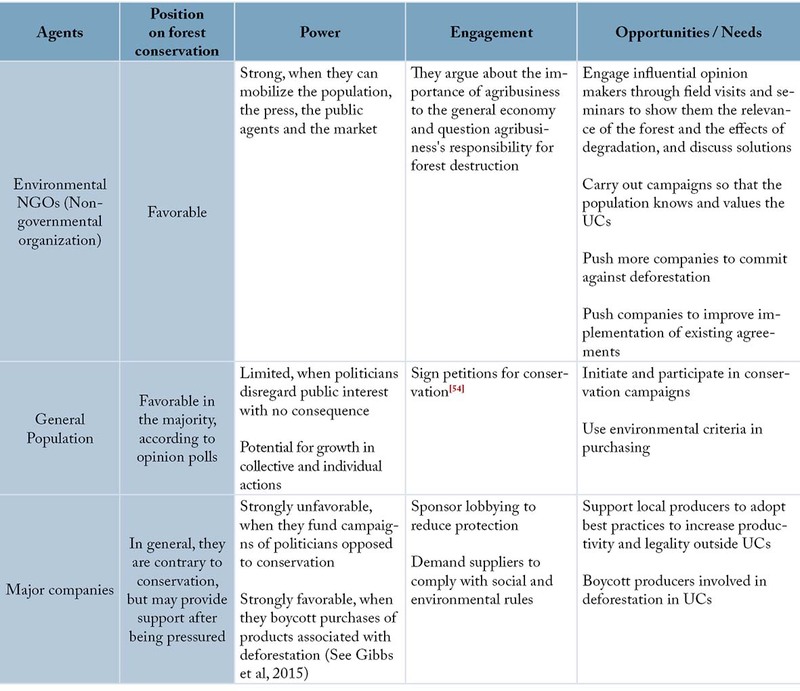 This approach could bring together environmental, cultural and commercial interests, in a manner similar to the North American experience with the creation of national parks (Table 2). ICMBio, the Ministry of the Environment and the Ministry of Tourism are on the right track, seeking to strengthen visitation to UCs, including concessions to improve the services provided (MTur, 2017; MMA, 2016), but still with little capacity in the Amazon. The region would require a much bolder approach involving other sectors, such as the one developed in North America (Table 3). In addition to local benefits, scientific research shows that conserving the Amazon is strategic for the country’s development because of its contributions to rainfall that supply agriculture, hydroelectric power plants, and industrial consumption in the Center-South of the country (Nobre, 2014). In order to engage national leaders that are not familiar with the Amazon situation, scientists, educators, and other professionals could develop programs that combine the presentation of scientific evidence about the Amazon with sensory and emotional experiences through field visits and other media (shows, movies, etc.). A number of cases illustrate the strength of these approaches. Various international executives and entrepreneurs who have led sustainability initiatives reveal that they have been interested in the subject because of significant personal experiences on the ground. In São Paulo, public advocates have been more involved in systemic advocacy for housing improvement rather than dealing with isolated cases, after visiting favelas guided by a local activist (Coslovsky, 2015). The US President Theodore Roosevelt was one of the most active advocates of the strategic conservation role of the USA, having created national parks and the American Forest Service (Todd, 2013). His commitment and ability to deal with these matters stemmed from his emotional attachment to conservation, cultivated by his interaction with nature since he was a child, and studies, and his close relationship with experts (See report of his leadership in Todd, 2013). See article 11, item 5 of Law No. 1.079 of April 10, 1950. See article 10 of Law No. 8.429 of June 2, 1992. An analogy with other public patrimony illustrates the incoherence of the lack of defense of the public lands in the Amazon: If companies were plundering pre-salt wells, would the government be inert and even create, through provisional measures, means for the looters to continue exploiting the wells? If the President of the Republic failed to protect wells, would the control agencies (MPF and TCU) cease to hold them directly accountable? President Theodore Roosevelt led several long-term conservation initiatives in the US. He made 25 major statements on the subject and organized the first White House Conference on Conservation in 1908. The conference was suggested by the Secretary of the Interior Water Commission to determine the infrastructure needed to provide water for the population. Roosevelt invited his ministers, governors and representatives of 70 national organizations, from entrepreneurs to the head of the General Federation of Women’s Clubs. His talk “Conservation as a National Duty” was based on studies by his team and on an engagement speech: the need to conserve natural wealth as a patriotic duty and a guarantee of the country’s progress. In order to reinforce engagement, the guests slept, dined and had lunch at the White House. From the conference, the following year a group was created that published the inventory of the natural resources of the country. In the United States, the creation and protection of parks was aided by a campaign initiated by a commercial ad from the Commercial Association of Salt Lake City (Utah) to boost tourism in the American West. The ten-year “See America First” campaign involved entrepreneurs, politicians, conservationists, and artists to mobilize the creation of areas, infrastructure and services. The scenic beauty of the areas was used as the central point of attraction and justification for protection, and included various rhetorical elements such as patriotism. In 2014, US national parks generated 277,000 jobs, and contributed about US$ 30 billion to the country’s economy, with 330 million visitors (Greenberg, 2015). 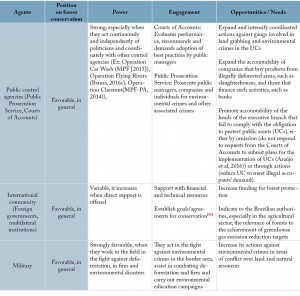 Possibly, the assassination of well-known leaders constrains the government to strengthen environmental protection, as occurred with Chico Mendes and Dorothy Stang (Lemos & Roberts, 2008). For example, 1.4 million people signed a popular initiative for zero deforestation (Greenpeace, 2016). For example, the Sustainable Development Goals and the New York Forest Declaration. In August 2016, ICMBio had 1,069 environmental analysts to manage more than 77 million hectares of federal UCs throughout Brazil. 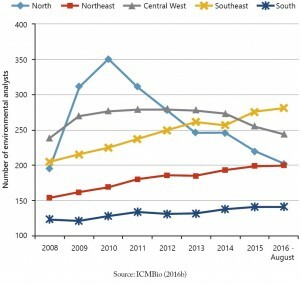 In a comparison among the regions of the country, we observed that the trend of reduction in the number of ICMBio environmental analysts occurred only in the Central West and North regions; but the situation is more serious in the North (Figure 1), which is home to most of the states of the Legal Amazon and 82% of the country’s total federal UCs. The imbalance between regions became more evident when we divided the amount of hectares of UC in each region by the number of analysts located therein. The North is the region with the worst ratio between UC area per environmental analyst, which is 309,625 hectares, an area 35 times greater than that managed by an analyst in the Southeast (Figure 2). The Northern region has also been losing environmental analysts at Ibama, who assist in field surveillance actions in the UCs. 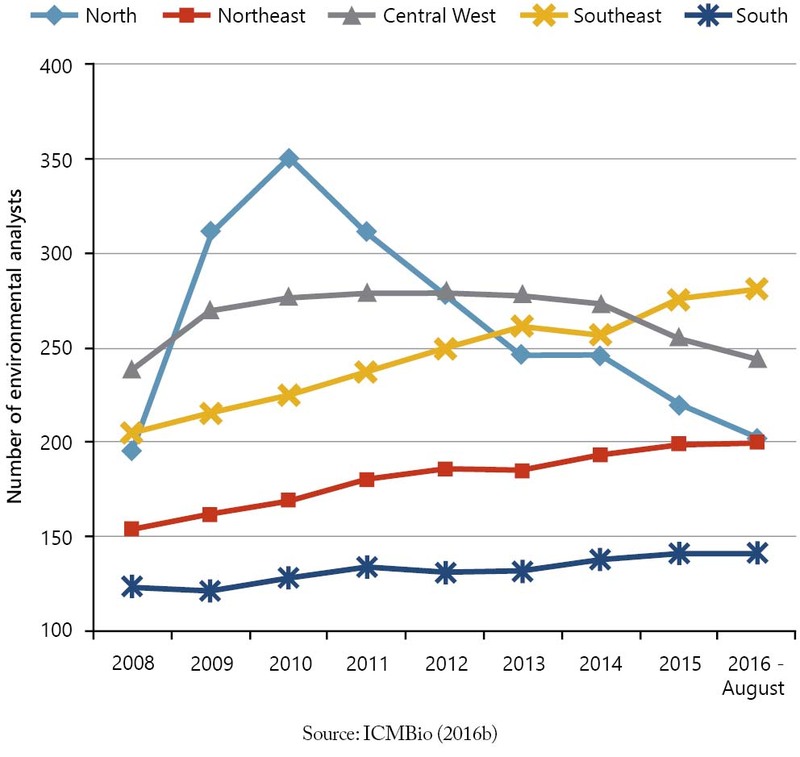 The comparison between the Brazilian regions shows that the only regions that suffered a reduction in the number of environmental analysts between 2009 and 2015 were the North and the Northeast, with 32% and 19%, respectively (Figure 3).